Natural blue pigments occur extensively throughout the plant kingdom, mainly in the form of anthocyanins (anthos = flower, kyanos = blue). Anthocyanins are responsible for the red, purple, and blue colours found in a variety of fruits, vegetables, cereal grains, and flowers (Konczak and Zhang 2004). Examples are found in the blue petals of flowers such as cornflower, hibiscus and morning glory, the skins of grapes, elderberries, blueberries and bilberries and the leaves of red cabbage. Unfortunately anthocyanin pigments are highly unstable and are totally unsuitable for dyeing textiles. Surprisingly the only satisfatory long-lasting natural blue dye is indigo. However indigo is not a naturally occurring plant pigment, and must be manufactured by fermenting plants that contain the appropriate precursor chemicals. Fortunately a wide variety of plants can be used, found in all the main climatic zones apart from polar and mountain. In principle the production of indigo is a simple process, although the underlying chemistry is complex. However in practice it is very difficult to produce a deep blue dye. Consequently in many societies, from Central Asia to Indonesia, indigo dyeing has always been a specialist craft, with secret protocols jealously guarded and passed down from generation to generation. Today in countries like Indonesia there are only a few good indigo dyers and indigo dyeing, unlike morinda dyeing, is an expensive process. The disadvantage of indigo is that it only adheres to the outer layers of a cotton fibre and so it is easily abraded. It also has poor wash and light fastness - indigo-dyed cotton continuously exposed to bright sunlight will show signs of fading in just a few weeks. 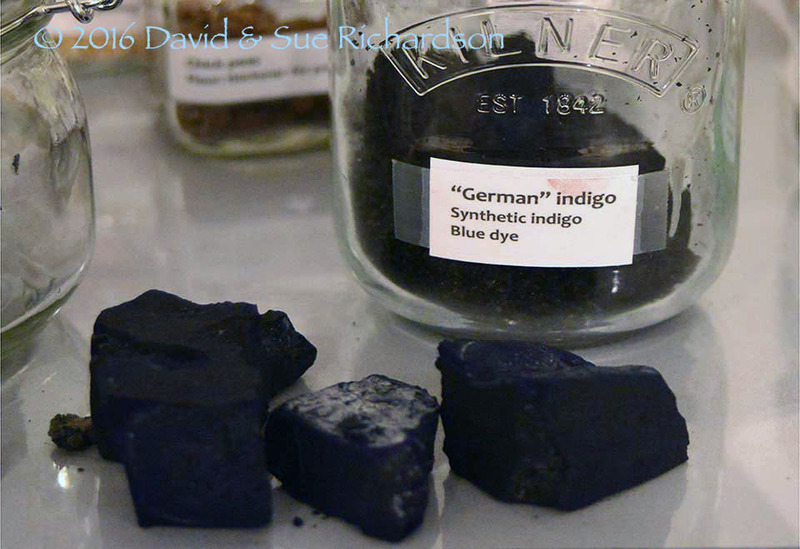 Synthetic indigo - indigotin - was developed in Germany and launched commercially in 1897. It had a major impact on the production of natural indigo, devastating the indigo plantation industry in British India within a decade. Although synthetic indigotin is chemically identical to the indigotin found in naturally derived indigo, it lacks the secondary pigments such as the red-coloured indirubin and yellow-coloured kaemferol, which give natural indigo its complex and attractive hue. Synthetic indigo also lacks the botanical impurities that initiate micro-crystal clustering, a phenomena that creates a deeper blue along with a degree of iridescence. Today both natural and synthetic indigo have been largely superseded by more technically advanced synthetic blues such as indanthrone blue, one of the first anthroquinone vat dyes, phthalocyanine blue and derivatives of diaminoanthrarufin. These all have far superior wash and light fastness but lack the artisan character of hand-dyed natural indigo. Some 600 different naturally occurring anthocyanins have been identified, many of interest to the food colorant industry. In Indonesia examples have been found in a wide variety of plants, including buni fruit (Antidesma bunius), butterfly pea (Clitoria ternatea), hortensia (Hydrangea macrophylla) and fig (Ficus padana). Anthocyanins are important members of the flavonoid group of chemicals, which also include yellow flavanol pigments such as kaempferol. The colour of anthocyanins is determined by a specific part of their molecular structure, known as a chromophore, which absorbs specific bands of visible light. 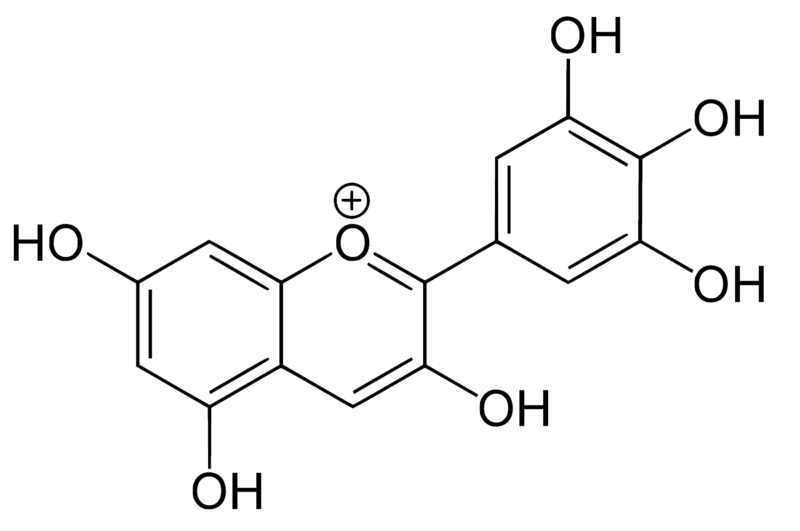 There are six major chromophores, which are all anthocyanidins with a very similar conjugated polycyclic structure whose names betray their floral origin – pelargonidin, cyanidin, peonidin, delphinidin, petunidin, and malvidin (Grotewold 2007, 155). In general pigment derivatives of pelargonidin and cyanidin produce red and purple colours, while those of delphinidin produce blue. Anthocyanins are soluble in water and alcohols but are highly unstable in solution and easily susceptible to degradation. Their stability is affected by pH, temperature, and the presence of enzymes, light, and oxygen (Rein 2005, 9). They can only be completely preserved under nitrogen at low temperatures in the dark (László 2015). Furthermore, the colour of anthocyanins varies with changing pH. Many are colourless at neutral pH, but turn red in acid solution and blue in alkaline solution (Giusti, Schwartz et al 2008). However anthocyanin colours can be enhanced and stabilized by the addition of different plant extracts and phenolic acids (Rein 2005, 66). While anthocyanins are used extensively as food pigments, they make rather poor dyes - being unstable and neither light-fast nor wash-fast. They are particularly susceptible to losing their colour after laundering. In the opinion of an experienced natural dyer, berries and grapes of any sort are suitable as a blue or purple dye only for projects that will never have to be washed. (Paula Burch 2012). If you try to dye textiles with most anthocyanins, you end up with drab greys or browns (Burch 2008). To make matters worse, anthocyanins bond poorly to cellulose cotton fibres which, unlike animal-based protein fibres, contain no acidic or basic functional groups (Séquin 2012, 172). Despite this, some anthocyanin dyes have been used to dye cotton. For example, Hibiscus mutabilis has been found to produce a dye with good fastness without the use of mordants (Haddar et al 2014). On the other hand, anthocyanins extracted from Hibiscus rosa sinensis flowers has been found to produce a colourfast range of pinks on cotton with the use of a variety of mordants. Depending on the mordant used, a more long-lasting blue, purple or blue-grey dye can be obtained by using the wood and bark of logwood (Haematoxylon campechianum), a small leguminous tree that grows in the swamp forests of Central America and the Caribbean. Large quantities were imported by the British cotton industry during the eighteenth century (Mayr 2014, 132). Blue requires the use of a copper or iron mordant (Bancroft 1814, 343). Blue pigments can also be extracted from gardenia (Gardenia jasminoides), which is a native of Southeast Asia, and from blue-green algae (Spirulina platensis). Indigo is by far the most commonly used blue vegetable dye and can be derived from plants found in temperate, sub-tropical and tropical climate zones. It was used extensively throughout Indonesia, including the Lesser Sunda Islands, for dyeing cotton - in the majority of regions accompanied by morinda. Although it has been replaced by synthetic dyes in many weaving communities, the traditional craft of indigo dyeing is still maintained in limited parts of the archipelago. The pre-eminence of indigo and morinda is not a coincidence but a consequence of the chemical inertness of cellulose, the principle component of cotton fibre. Most natural dyes and inorganic mordants bind in acidic solution. However cellulose is readily degraded by strong acids, hot weak acids and strong alkalis, so preferably needs to be dyed under neutral or weakly alkaline conditions. Indigo not only satisfies that requirement, but also has no need for a mordant. 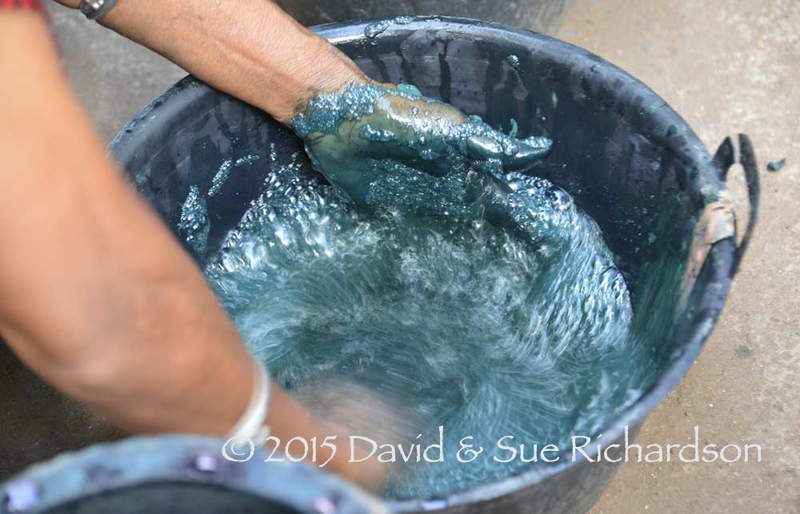 Even so it only binds to cotton loosely, so many repeat dye immersions are required to build up a deep blue colour. The simplest indigoids have plain unsubstituted benzene rings. Thus for indigotin, X and Y are both amino (NH) groups; for oxindigo they are oxygen atoms; for thioindigo they are sulphur atoms; and for selenoindigo they are selenium atoms. Indigocarmine has the same structure as indigo but the benzene rings are sulphonated, while the halogenated indigos also have the same structure as indigo but one or both benzene rings are brominated or chlorinated. Indigoid dyes do not occur in nature, although their precursors do – the indigotin precursors indican, isatan A and isatan B in the plant world, and the Tyrian purple precursor tyrindoxyl sulphate in the animal world. By far the most important member of the indigoid family is indigotin, traditionally obtained by the enzymatic reduction of plants of the indigo family. One of the key advantages of the indigosol family of dyes is that they are water-soluble. Indigocarmine is an important biological marker dye while thioindigo is used in textile printing. Indigo is not a naturally occurring dye. It must be artificially processed from the naturally occurring precursors indican and isatan. Indigo can be derived from a wide range of plant species. 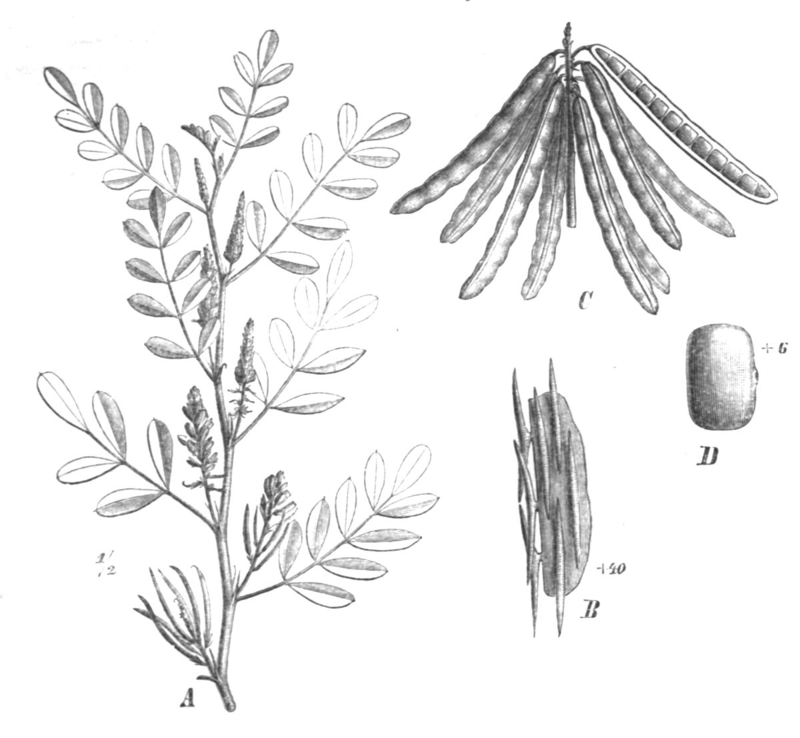 In temperate Europe it was obtained from woad, Isatis tinctoria; in West Africa from Yoruba indigo, Lonchocarpus cyanescens; in Taiwan, the Ryukyu Islands, and Southeast Asia from Assam indigo, Bapicacanthus cusia; in Southeast Asia, Sumatra and Java from the coarse milkweed vine, Marsdenia tinctoria; and in China, Korea, Japan and Central and South America from Japanese indigo, Polygonum tictorum or Persicaria tinctoria, also known as dyers knotweed, a member of the buckwheat family. The most important natural source of indigo today is from plants belonging to the genus Indigofera, part of the enormous Leguminosae pea family. The Indigofera comprises over 750 species of tropical and sub-tropical herbs and shrubs, the most common generically referred to as indigo. Generally the Indigofera contain a higher concentration of indican than the non-Indigofera species. Different sources report that from 30 to 175 times more indigo dye can be obtained from the same amount of tropical indigo as opposed to woad (McCulloch 1852, 1427; Goffer 2006, 372). Indigo yields from Marsdenia tinctoria in Thailand were found to be less than half those of Indigofera (Teanglum et al 2012). Finally Balaram found that Indian indigo was five times more effective at dyeing than Japanese indigo. In some countries people use different sources of indigo in different regions. 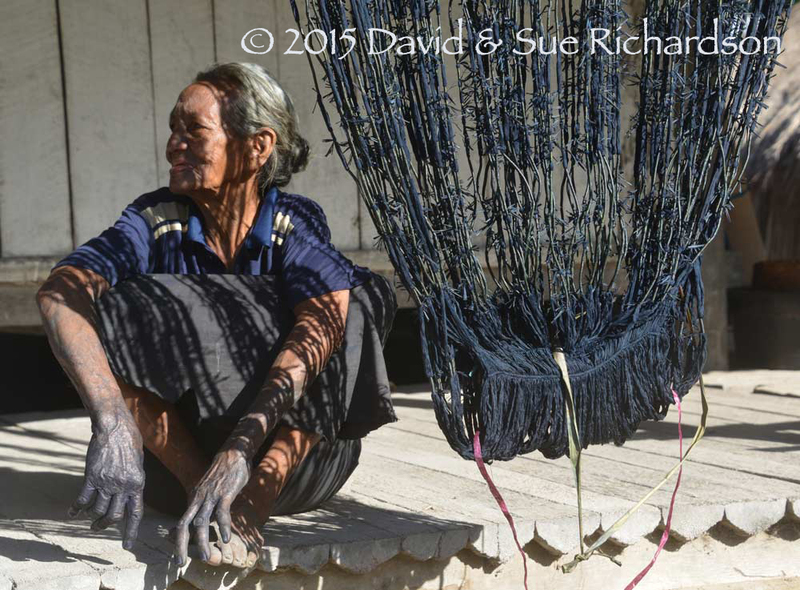 For example in southwest Sarawak the women of Saribas region (Betang Division) obtain their indigo from Indigofera (tarum). However in central Sarawak women in the interior Baleh region of Kapit district use Marsdenia tinctoria, known locally as renggat. This grows both as a shrub, called renggat padi, and as a creeper, called renggat akar (Linggi 1999, 38). The word indigo is derived from the Greek indikon, Latinised by the Romans to indicum, meaning ‘Indian’ or ‘coming from India’, highlighting the source of indigo for the Graeco-Roman world. However Indigofera was not only found in India – it was distributed globally throughout the entire tropical zone long before the arrival of man, with different species having evolved and spread into different geographical environments. Tethyan, restricted to arid lowland climates, as well as to the succulent biome in Africa. With over 300 species located in Africa, the authors concluded that Indigofera probably originated in that continent in the succulent rather than grassland biome, at a time genetically estimated at around 16 million years ago. The emergence of lowland grassland varieties, which were weed-like and invasive, eventually resulted in its global dispersal. However this was geographically constrained by a combination of topographical and ecological factors. Migration seems to have been especially channelled through arid corridors, while at the same time random genetic drift gave rise to an increasing number of species, each adapted to specific geographical regions. It is only much more recently that the natural distribution of Indigofera has been extended by human cultivation, selection and trade, reinforced by its preference for open and disturbed land. Some species probably extended their ranges along the pre-Islamic trade routes linking Arabia, West Africa and Southeast Asia. In Eastern Indonesia some species seem to have been deliberately imported from island to island in relatively recent times. During the eighteenth century the Dutch VOC encouraged rulers in Central Java and Timor to plant and cultivate indigo, using plants supplied by the company (Fox 1980, 42). In the nineteenth century two more significant initiatives led to a major expansion of indigo cultivation on Java. Under British rule Raffles introduced a system of land tax, which was reformulated following the restoration of Dutch control in 1816. Peasants were required to cultivate one fifth of village land with cash crops such as indigo or sugar on behalf of the government (Wahid, 1975, 35). In 1830 the new Governor General of the Netherlands Indies, van den Bosch, launched a new cultivation initiative, the Cultuurstelsel, inspired by the British colonial plantation system. Plantations were established in locations such as Cirebon and Pekalongan in north Java to cultivate indigo, sugar and coffee for export. As part of this initiative the Dutch introduced both Natal and Guatemala indigo into Java (Fokkens 1910, 45-48). Indeed I. guatimalensis, introduced by the Dutch in the nineteenth century, is still harvested in the Kerek sub-district of Tuban today, where it is known as tom gresi or presi (Heringa 1989, 113). In practice the production of indigo proved to be uneconomic and in the 1850s its development was halted. Nevertheless production continued to grow, reaching a peak in 1898 before collapsing by over 80% over the next decade. 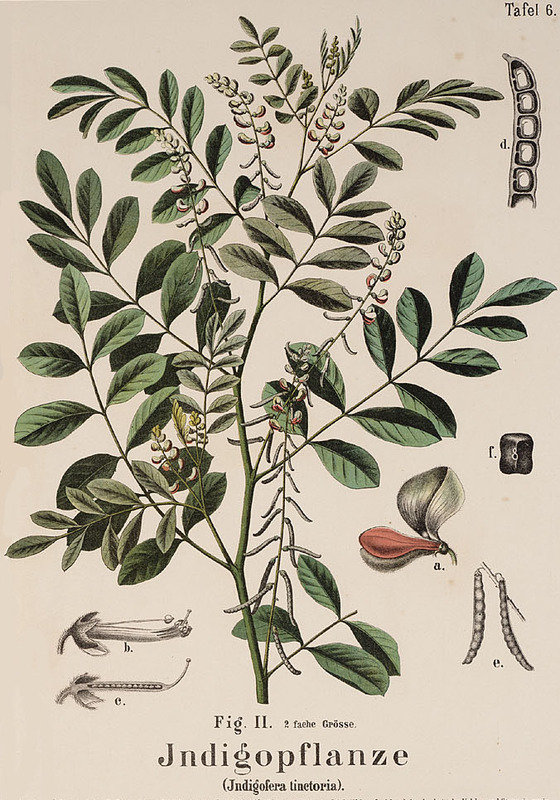 With a combination of endemic and introduced varieties, the Regent of Blora, north central Java, could list six types of locally growing indigo in the early twentieth century: Bengala, Katémas, Pèrsi, Galoerade, gènjah oerang, and walik (Jasper and Pirngadie 1912, 65). 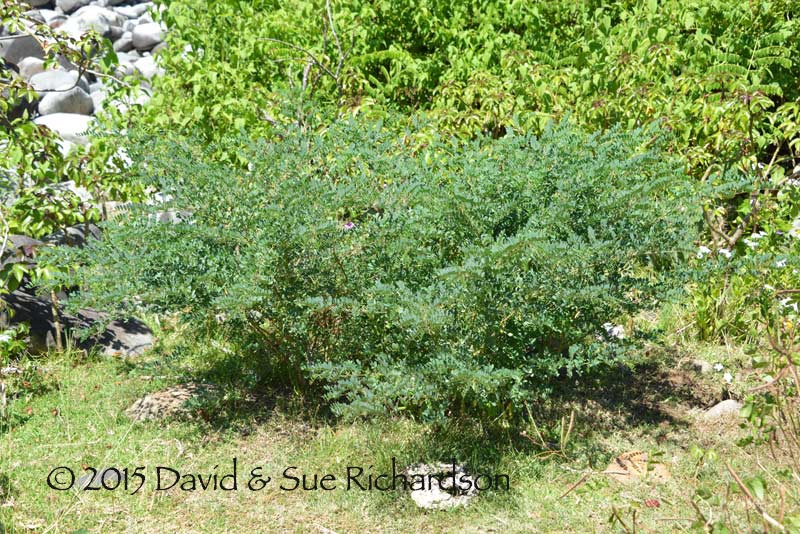 Indigofera tinctoria, known as common or Indian indigo, appears to have been domesticated in India, but is now found widely across Africa, Arabia, Southeast Asia and Indonesia (where it is named I. sumatrana). It prefers altitudes below 1000m. Indigofera arrecta, known as Natal, Bengal or Java indigo, originated in tropical Africa but is now distributed widely throughout the tropics. According to Heyne, 1927, the Dutch introduced it to Java in about 1860. It tolerates altitudes up to 2700m. Indigofera longiracemosa is indigenous to tropical East Africa, Madagascar and South India but has been introduced into Indonesia. It normally grows in lowland coastal regions but in Indonesia it is vulnerable to pests so is grown at higher altitudes of around 1,650m. Indigofera hirsuta, or hairy indigo, is native to Africa, Southeast Asia and New Guinea. Indigofera suffruticosa, known as West Indian or Guatemala indigo, originated in tropical America, but is now found in West Africa, Madagascar, Southeast Asia and Java. There are annual, biannual, and perennial varieties of each type, apart from I. hirsuta, which is a purely annual species. The perennial form of I. longiracemosa is short-lived. All of these species are leguminous nitrogen-fixing herbs, sub-shrubs and shrubs with pinnate blue-green leaves and dark pink to purple pea-like flowers. The first three varieties are tall and erect, growing up to 2-metres in height, but I. suffruticosa is short and only reaches 250cm in height. All thrive in hot and humid climates across tropical and temperate Asia, preferring full sun and fertile soils. However they will not tolerate shade. Because they develop slowly during their initial growth phase they need a long, hot growing season, preferring temperatures around 23°C. They will not tolerate temperatures below 19°C and most varieties do not survive at high altitudes, even in Indonesia. Although they are well adapted to dry conditions, they shrivel during the long hot dry season and are therefore mainly harvested during the rainy season. The Indigofera are fast colonisers. Their flowers have an explosive floral tripping mechanism for distributing pollen. At the same time, most Indigofera species disperse their seeds through the spontaneous explosive rupture of the seedpod, a process called dehiscence. It occurs because of the presence of a separation layer in the dorsal and ventral sutures of the pod. However some species show adaptations for dispersal by wind. The amount of indigo dye that can be extracted from plant material is relatively small, and varies from report to report. It has been estimated that in 1900 dyers obtained 7kg of pure indigo from 3,700kg of fresh Indigofera tinctoria leaf, a yield of 0.2% (John 2009: 118). 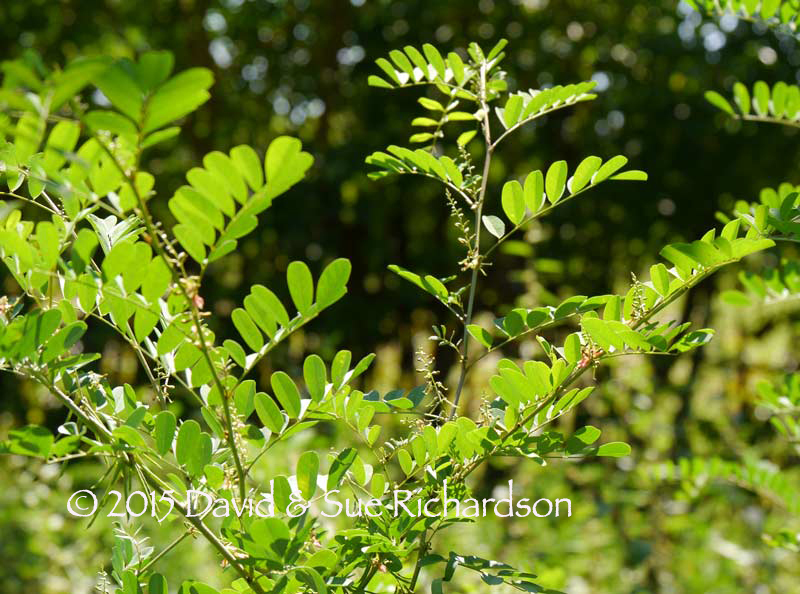 A more recent Thai study recovered 0.33% of indigo dye by weight after macerating fresh Indigofera tinctoria leaf for 24 hours (Chanayath et al 2002). Indigo may have been used as a dye since the early Neolithic, although at present, evidence of its earliest use comes from a 6,200-year-old cotton fragment found at the site of Huaca Prieta in Peru (Claro et al 2016). Other early finds from the Indus Valley and the Egyptian Nile date to the third millennium BC, while finds from China date to the second millennium BC (Barber 1991, 227). Likewise the Maya and Aztecs may have used Maya Blue, a mixture of indigo and palygorskite clay, for millennia - although the earliest known samples date from the period 300 BC to 300 AD (Pascual et al 2009). Marco Polo described how indigo was prepared as a dye at ‘Coilum’, modern Kollam on the coast of Kerala, India, in about 1293. The plants were harvested, stripped of their roots, and steeped in water in large vessels exposed to the hot sun until they decomposed. The coagulated dye was divided into four-ounce pieces for export to Europe (Yule 1871, 312). The second historically important indigoid is Tyrian or Royal purple, 6,6’-dibromoindigo, traces of which have been recovered from an eighteenth century BC site on Crete and a thirteenth century BC Phoenician site in the Lebanon (Gaboriaud-Kolar et al 2014, 90). The ancient Jews called it tekhelet, a purple dye mentioned numerous times in the Hebrew Bible. Extracted in microscopic quantities from the glands of predatory sea snails such as Murex trunculus and Murex brandaries, it was the most precious dyestuff in antiquity. It is likely that the process for producing indigo dye from wild Indigofera was discovered independently in many parts of the tropics a long time ago. It can easily be produced unintentionally – for example as a result of indigo animal forage accidentally falling into a puddle of urine. Robert Blust has shown that while the Austronesian word for indigo, tarum, was not part of the proto-Austronesian lexicon, it was part of the proto-Malayo-Polynesian and the proto-Central-Eastern Malayo-Polynesian lexicon – indicating that indigo was already known during the early stages of the Austronesian expansion, and therefore by the first Austronesians who settled in Eastern Indonesia (Blust 1984/5, 52 and 61). Indeed it may have been used from the earliest times in China. The chapter Xiao Ya in the Shi jing describes women collecting indigo plants at the time of the Xia Dynasty, during the early second millennium BC (Sun and Zheng 1998, 226). It was cultivated in Southeast Asia during the first millennium BC. However the earliest historical reference to indigo in the Lesser Sunda Islands occurs very much later - in the Sukawana inscription of 883 AD on Mount Kintamani, Bali, which lists the occupation of indigo-dyeing, mangnila, and morinda-dyeing, mamangkudu, as being exempt from taxation (Stuart-Fox 1993). The early Portuguese and Dutch colonists never regarded indigo as an important resource of the East Indies. The Portuguese imported some indigo from the East Indies into Antwerp during the late 1500s, and a trial shipment of Javanese indigo was received in Amsterdam in 1694 (Beckmann 1846, 274; Eikema Hommes 2004, 123). Generally indigo was more readily available elsewhere. Of the seven ships of van Dieman’s fleet that arrived in Holland from the East Indies in 1631, all were carrying indigo – a total of 165 tonnes – all sourced on the return voyage from ports in Gujarat and West Africa (Beckmann 1823, 323). It was only much later, in the mid-nineteenth century, that the Dutch exported significant quantities of indigo from their newly created plantations in Java. Botanists have found that Indigofera species grow widely in grassland environments throughout Nusa Tenggara, but have not identified the specific species concerned or their distribution (Monk et al, 1997, 299 and 758). Yet one only has to visit the region to observe that several varieties occur on each island, some apparently endemic and others introduced. dao Hava, also called dao kota, (Indigofera arrecta), which is said to have been imported from Sumba (Hava) and Kupang (kota). It is interesting that in the domain of Kodi in West Sumba, oral tradition claims that the art of indigo dyeing was imported from Savu, and people of Savunese descent still specialise in indigo dyeing in that region (Hoskins 1993, 52). On Roti there are at least two varieties of indigo – Rotinese indigo (tau do Lote) and Dutch indigo (tau do Olana), the former being an endemic variety adapted to the dry climate with woody stems and very small leaves, the latter introduced by the Dutch (Fox, 1980, 43). Indigo was highly valued by the Rotinese and may have been used as a means of distinguishing themselves from the Timorese. Whereas the latter inserted a prominent white band in their men’s wrappers, the Rotinese inserted a pure black band instead. Three types of indigo have been reported in West Timor. Tau kesa is the largest variety but does not produce the best depth of colour; tau tiaum is smaller and is rated best by local weavers for colour; while tau fu is a local variety that grows in the forest and is not used for dyeing (Barkmann 2006, 63). Indigo grows wild throughout the Lesser Sunda Islands but in some weaving communities indigo seed is usually planted in fields around the villages, often after the maize or paddy rice harvest. Indigo grows well in poor soils so even on the non-volcanic islands it grows lush during the rainy season, which normally lasts from November to March and is more intense in the west. The concentration of indican in the leaves reaches a maximum just before flowering. Consequently most indigo harvesting and dyeing takes place towards the end of the rainy season (around March), about four or five months after sowing. Despite being drought-resistant the plants wilt and lose their leaves during the long dry season from April to October. Indigo does not thrive in the highest villages of Ngada Regency, such as Mangulewa with an altitude of around 840m, so the local people dyed their cotton with mud (Hamilton, 1994, 104). 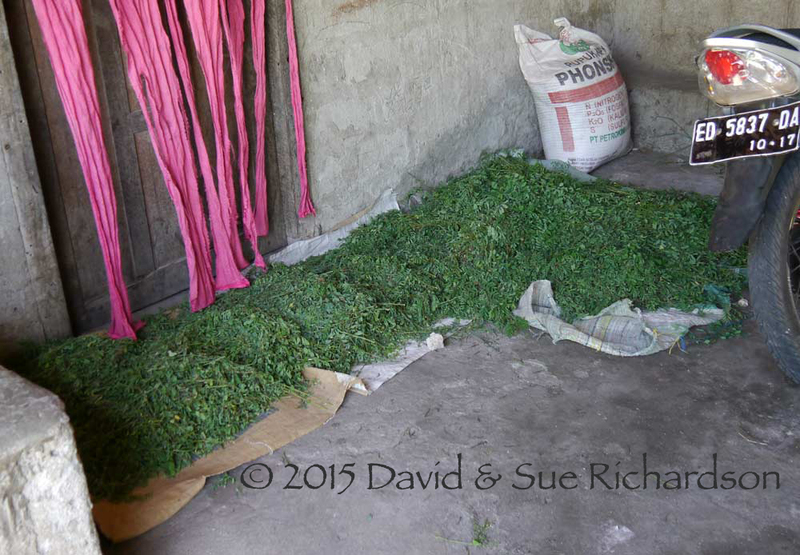 In Lamalera indigo grows wild around the village, but in insufficient quantities for dyeing. Indigo for dyeing is therefore obtained through barter from the villages above Lamalera on Ile Labalekan. There it is sewn in the fields following the maize harvest towards the end of the dry season so that it can be cropped later in the rainy season. Unlike most natural dyes, indigo has the advantage that it does not require a mordant. Its disadvantage is that it is insoluble in water. To be used as a dye it must be chemically reduced into a soluble form called leuco-indigo, and then after dyeing oxidised back into its insoluble blue form. This reversible reduction-oxidation process is known as ‘vatting’ and therefore indigo is classified as a ‘vat’ dye. In short, dyeing can only take place in a vat or pot containing a soluble reduced form of the dye. As with many natural dyes, the preparation of indigo is a smelly business. 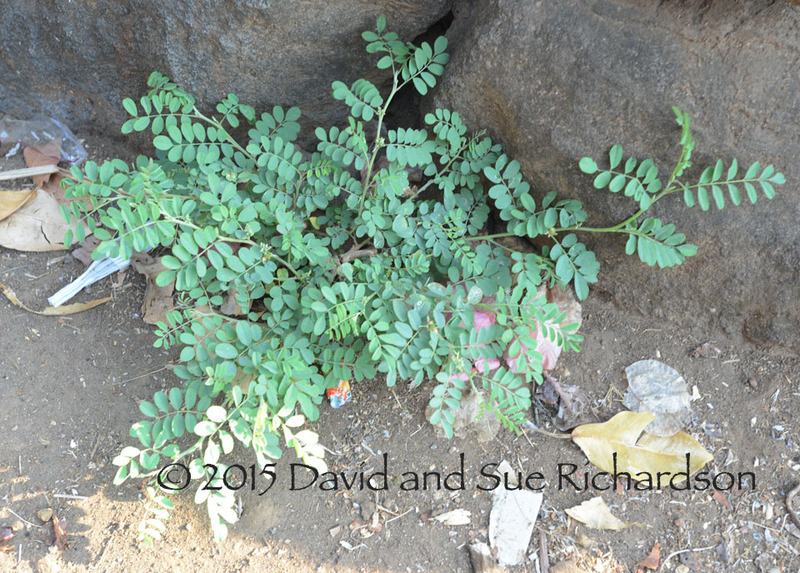 The indigo plants are cut down just above the ground and are allowed to wilt for half a day. They are then steeped in cold water for a day or two in a handmade clay pot or plastic bucket, after which the hard parts of the plants are removed. The resulting slimy dark blue liquid must now be fermented for a few days to hydrolyse the indican into soluble leuco-indigo, often called indigo-white despite its pale yellow appearance. The fermentation process depends on an alkali-loving bacterium that comes from the indigo plant itself and produces an enzyme that turns the indican into soluble indigo-white. To drive the process the bacteria need to grow in a weak alkaline solution at a temperature of between 25°C and 35°C, while being fed with nutrients. Given the tropical heat of lowland Indonesia, artificial heating is not normally required. The most crucial factor is to maintain the pH in the range 10.0 to 11.5 (neutral is 7.0). Burnt coral or shell, lime, or plant ash is used to create the alkali, while honey, molasses, sugar, cooked rice, tapioca, pineapple, banana, fermented cassava or other plant species are added to feed the bacteria. Some dyers add stale urine (Forshee 2001,77). To prevent premature oxidation the dye mixture must not be vigorously stirred. For similar reasons the dye pot is sometimes covered with leaves or other items during the fermentation process. Once the mixture turns a clear greenish-yellow the reduction is complete. The soluble leuco-indigo can now be used to dye the cotton. The skeins of cotton are immersed in the dye bath and are kneaded until the fibres have been evenly penetrated. They are left to steep, sometimes overnight, sometimes for longer. For example at Bolok, the Helong dyers first steep the indigo leaves in water for one day before removing them and adding powdered lime. They then immerse the cotton skeins for three days before removing them and shaking them in the air. The leuco-indigo is quickly oxidized back into insoluble indican, changing to greenish-blue and finally blue. The threads are hung up to dry, great care being required to ensure the cotton dries quickly and thoroughly to prevent rotting of the cotton fibre, especially the ikatted sections bound with strips of palm leaf or plastic. The indigo precipitates on the surface of the cotton fibres, but does not chemically bond with the cellulose. It adheres to the cotton as a result of weak hydrogen-bonding and this means that the indigo can be removed by abrasion or repeated washing. Unlike modern synthetic dyes, indigo is a relatively weak dye so to build up a deep blue colour the cotton must be repeatedly immersed in the dye bath, being hung up and allowed to oxidize and fully dry between every immersion. The number of times varies depending on the depth of colour required. For example in Lamalera dyers distinguish between light blue, pelã belurã, dark blue, pelã mitã, and very dark blue, kepaõ (Barnes, 1989, 93). In East Sumba ikat designers tend to send their bound yarns to specialist indigo dyers, who require several months to complete the initial dyeing process. The yarns are immersed in the dye bath for a day or two and are then hung up to dry in the sun for up to two weeks. This careful drying is essential because the cotton yarns are easily broken if they have been left in a wet condition for a long time. After five immersions the yarns are returned to the workshop, where those small parts of the design that will eventually be light blue are unbound. The yarns are now returned to the dyer for a further two immersions. At the end of the process most of the unbound yarns will be dark blue apart from the light blue sections that have only been dyed twice. Swatches of cotton, silk and wool that have been progressively dyed in indigo from one to six times, each immersion taking 15 minutes. Dyed and photographed by Catharine Ellis and reproduced with her permission. Dyers living below the Ilé Api volcano on the north coast of Lembata Island, repeatedly dye their yarns up to thirty times in order to obtain a deep blue that borders on black. This is a laborious process, undertaken during the rainy season, each immersion taking two full days after which the yarns must be thoroughly dried before the next immersion. Although repeated indigo dyeing can produce a very dark blue, it is impossible to achieve a true black with indigo alone. 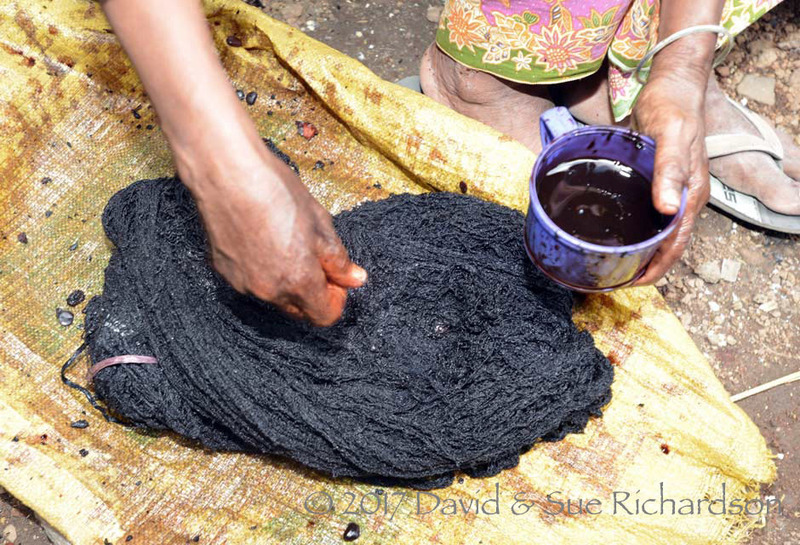 To obtain a true black, the dyers on Ilé Api finish their deepest indigo-dyed yarns by treating them with a cocktail of tannins. On Roti, where black was highly valued, dyers repeatedly dyed their threads daily for up to 30 days. To achieve the deepest blue, some threads were dyed for a full year. To make black, some weavers add tannin plants to their indigo vats, or overdye the indigo with tannin and iron. 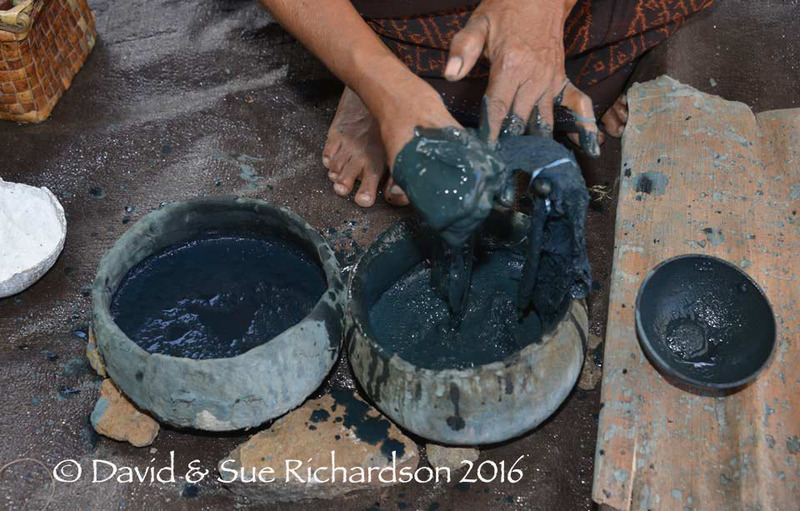 The black mud in Rindi, East Sumba, is particularly rich in iron and other minerals so some local weavers soak their threads in mud-holes to obtain an even, colourfast black. 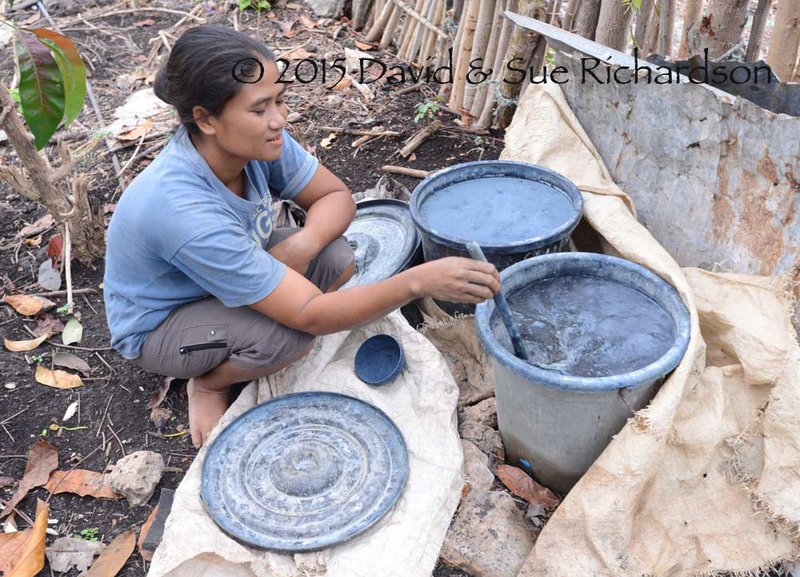 In Sikka Regency some dyers add the leaves of the lea ramu plant to indigo to make it black. 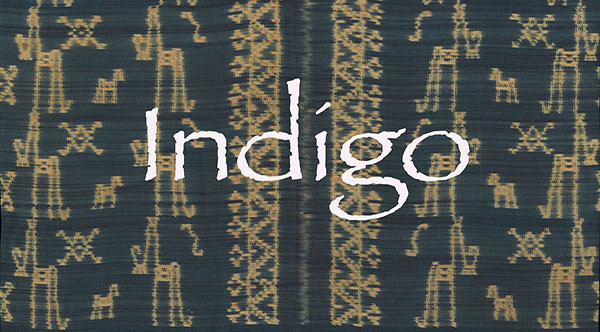 In Manggarai indigo was sometimes overdyed with various wood or bark dyes to darken the colour (Hamilton 1994, 91). Details of the indigo dyeing process vary from place to place, depending on local traditions and ecology. For example, some villages produce a weak alkali lye by filtering their water through an open-weave basket containing the ash from burnt wood or twigs, while others just add lime powder obtained from calcined (burnt) white coral, seashells or sometimes on the non-volcanic islands, burnt limestone. Some use a mixture of both. The ash must be from local woody plants that have a high alkali content. It is hard to identify the species, concerned because villagers use local names. For example, Onvlee found that in parts of East Sumba dyers used the ashes of kahembi wood (Adams, 1969, 74). In parts of Timor they increase the alkalinity by adding the leaves of Jatropha curcas (Cunningham et al, 2014, 95). The list of ingredients added to the indigo mix seems to be endless. Some that have been identified in the past include a cocktail of lime, vinegar, molasses, and tamarind - used to aid the fermentation of indigo for dyeing batik in Central Java (Van Musschenbroek, 1877). In the same region, at a much later date, they used indigo paste in combination with lime and the reducing agent ferrous sulphate (Warming and Gaworski, 1981, 158). Bühler found that on Sumba some dyers also added morinda to the indigo vat, along with the shavings, wood and barks of three unidentified plants. In West Sumba, wood shavings and unidentified tree barks were added, while on Roti one dyer added the barks of mangrove, Peltophorum pterocarpum and Schleichera oleosa (Bühler, 1939, 87). On Savu, one dyer added palm sugar, turmeric and betel nut. A local root was added to repel insects and worms from the fermentation (Warming and Gaworski, 1981, 68). Niessen found an elderly Karo Batak dyer in Kampong Kwala who also added palm sugar to her indigo dye bath, along with turmeric, ash and lime (2009, 441). In some parts of Flores and on Sumba certain dyers recover the precipitated indigo and store it as a paste in sealed jars to prevent oxidation. Others dry it into cake. Some of this is then added to the next fresh indigo dye bath to be reduced and to increase the concentration of soluble indigo. However the paste is never re-used alone. As a biological process, the fermentation of indigo leaves can easily go wrong. The temperature can be too high or too low, insufficient sugar can halt bacterial growth, the pH can be spoilt by acid released by the bacteria, while over-fermentation can ruin the whole batch. Consequently throughout Eastern Indonesia the dyeing of indigo has been traditionally regarded as a sacred, magical process, surrounded by beliefs, superstitions and prohibitions. Though not as strong as in the past, these attitudes still persist today. Indigo dyeing was and still is strictly restricted to women and the most experienced dyers tend to be post-menopausal women. Men are not only prohibited from participating in the indigo dyeing process, but are forbidden to see or approach the indigo dye pots. 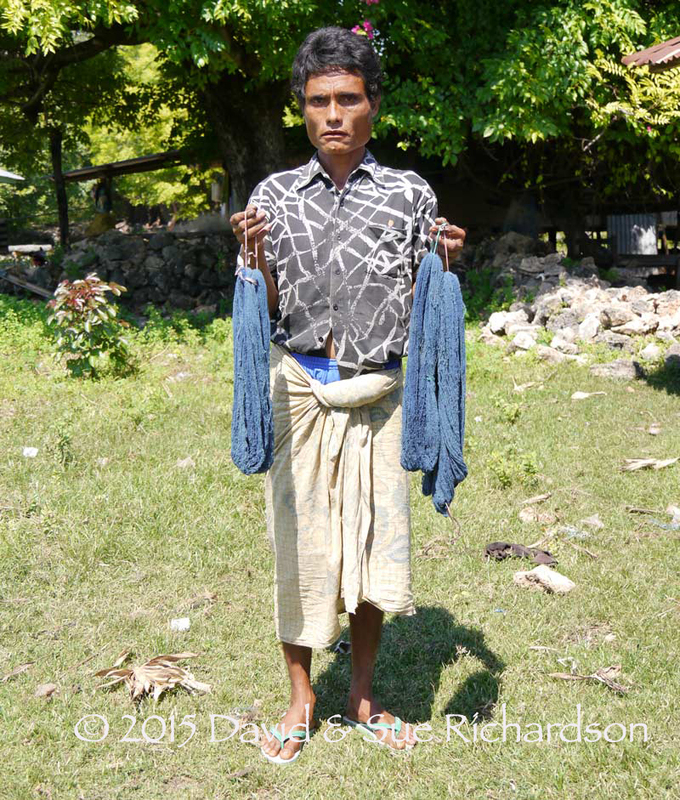 However this prohibition has an interesting interpretation - one well-regarded indigo dyer in East Sumba is a homosexual male. Homosexuals were also involved in dyeing in Nggela (De Yong 1994, 214). The finer details of the indigo dyeing process have always been a strictly held secret, passed on from mother to daughter. Dyeing was concealed from prying eyes, conducted out of sight in a secluded outbuilding or an isolated part of the yard. Indigo dyeing is closely linked to female fertility and witchcraft and involves a significant element of danger - to both women and men. Menstruating women are forbidden to go near the dye pots for fear that their blood flow will spoil the fermentation process. In Kodi, pregnant women must not look at the pots because the churning dye will dissolve the contents of her womb and cause an abortion, while menstrating women are thought to make the indigo dye run irregularly (Hoskins 1989, 150). In East Sumba, pregnant women believe that contact with liquid indigo can cause a miscarriage while men believe it can cause disease or madness (Forshee 2001, 32-33). The latter author refers to Biba, who blamed her own miscarriage on the fact that she had previously handled some damp blue yarns (Forshee 2001, 65). A stillborn birth in 1993 was blamed on the mother having sat too close to an indigo dye pot some days earlier. Some indigo dyers are also skilled in making herbal medicines and potions. On Roti, the local name for indigo, tau, is associated with the words for fear and frighten, while bad spirits darken or blue their victims (Fox 1973, 350-351). Wild indigo is known as the 'indigo of the spirits' because of its powers. While the spirits can use it for evil intent, it can also be used to advantage. If a person dies a 'bad death', a full pot of indigo must be poured over the grave, the blue dye 'fixing' them in the grave and preventing their soul from wandering (Fox 1973, 360). Such beliefs are particularly strong in the Kodi domain of West Sumba (Hoskins 1989, 148-151; Hoskins 2007, 102-105). Here indigo dye is associated with death and considered to be dangerous to all men and to women of reproductive age. Consequently the dye shack is always located in a remote spot out of sight from the village. Two matrilineal clans or walla specialise in indigo dyeing. There a chicken must be sacrificed before each dye pot is prepared, its soul dedicated to the Savunese ancestress who supposedly introduced indigo dyeing to the region. Among the Rembong of Manggarai, women were forbidden to swear during the indigo harvest to ensure that the plants will yield up their indigo. Before the dye pots were set in place a sorcerer would use special phrases to chase away evil spirits. Seven threads and seven pieces of iron were placed under each pot, so the spirits of the deceased could not interfere with the indigo dye. Finally a piece of cloth was waved above the pots before the dyeing commenced. (Erb 1994, 206). In a few places in Eastern Indonesia it has been traditionally forbidden to produce indigo. One such region is that of Cape Sasar in northern East Sumba, which includes the village of Wunga, believed to be the original first village . In the absence of indigo, cloths were mud-dyed by initially steeping them in a hot bath of tannin rich barks and leaves and then immersing them in stagnant mud that was rich in ferrous salts. Geirnaert (1993, 212-213) speculates that the indigo prohibition is because Cape Sasar is the mythical place of origin of the Sumbanese, and is therefore the land of the dead – the place where the ancestors lead the recently deceased back to their place of origin. Whereas indigo cloths represent a form of reincarnation, ‘black mud-dyed cloth represents the putrefying stage of the deceased as he pursues his journey to the land of the dead’. The most extreme situation occurs in the village of Tenganan Pegringsingan on Bali, where indigo dyeing is considered impure and is therefore totally forbidden. The first dyeing stage with indigo is therefore subcontracted to the neighbouring village of Bugbug (Bühler 1943, 243-247). Interestingly indigo was outlawed by the Holy Roman Empire in 1577, as a means of protecting the woad dyers of Saxony. Indigo was declared to be a colour hurtful, deceitful, corrosive and diabolical. Severe penalties were imposed on dyers who ignored the prohibition (De Beauvais Raseu 1794, 91). The mandate was renewed in 1654. The use of indigo was likewise forbidden in France from 1596 to 1669, but was later repealed under Louis XIII (Rhind 1841, 500). We have already referred to indigo as being a ‘vat’ dye which requires the total immersion of the yarns into a soluble reduced form of the dye. However during the early eighteenth century European dyers sought a means of applying indigo to a cloth directly. They eventually copied a technique that had been used in India for adding fine indigo detailing to cloth, without the use of a resist. Gittinger (1989, 7 and 10) has identified seventeenth century textile hangings from south India decorated using the same or a similar technique. A paste was produced from a concentrated indigo solution containing lime, a thickening agent such as honey, starch or gum Arabic, and a strong reducing agent. For the latter they used orpiment, a volcanic mineral rich in highly poisonous arsenic trisulphide. The cocktail was applied with a brush, just like paint, and it turned blue following sufficient exposure to air. It became known as ‘pencil blue’ or ‘brush blue’. As well as being extremely dangerous it also had other disadvantages – William Morris tried out the technique but was disappointed with the unevenness of the final colour produced. In many parts of Indonesia, such as Sulawesi, East Java, Ende, Sikka, Lembata and East Sumba, indigo dyed threads are partly or completely overdyed with morinda to create a dark purple-brown colour. Cotton that is to be overdyed only needs a limited number of indigo immersions before the start of the morinda dyeing process. On the north coast of East Java the overdyeing of indigo with soga tingi was called nyoga, a term that may have also applied to the overdyeing of indigo with morinda. In the Kerek sub-district of East Java, where many of the old traditions of batik production still persist, elderly dyers still remembered once using morinda root. However by the 1980s morinda was no longer available and had been replaced by synthetic napthol dye from Surabaya (Heringa 1989, 113 and 124). The Ata Sikka bridewealth cloth is called an 'utang mérang (red skirt) and its main ikat bands must be a deep purple-brown, known as wungung, achieved by one or two indigo immersions followed by multiple morinda immersions (Lewis 1994, 162). The Lamaholot (and only the Lamaholot) refer to this over-dyeing process as belapit, which is essential for all bridewealth textiles (Ruth Barnes 1994, 20). The deep purple, which almost appears black, is called fange (Ruth Barnes 1994, 45). Generally cotton is first dyed with indigo and secondly with morinda but there are exceptions. In East Flores the kenuma for the kewaték mé’an are always dyed with morinda first, and a portion are then later partially overdyed with indigo (Graham 1994, 235). 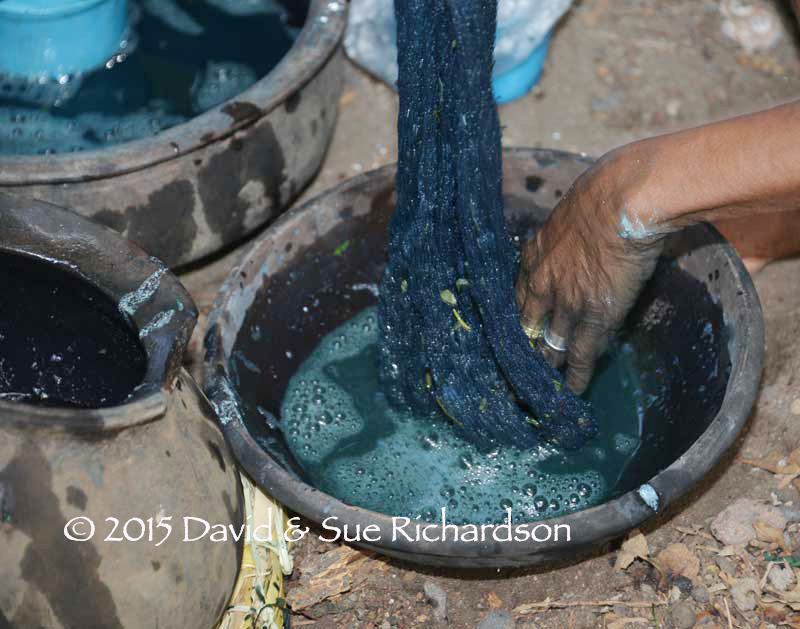 On Savu some dyers obtain a darker indigo blue by means of an initial immersion in morinda before the start of the indigo dyeing process (Duggan 2013, private communication). 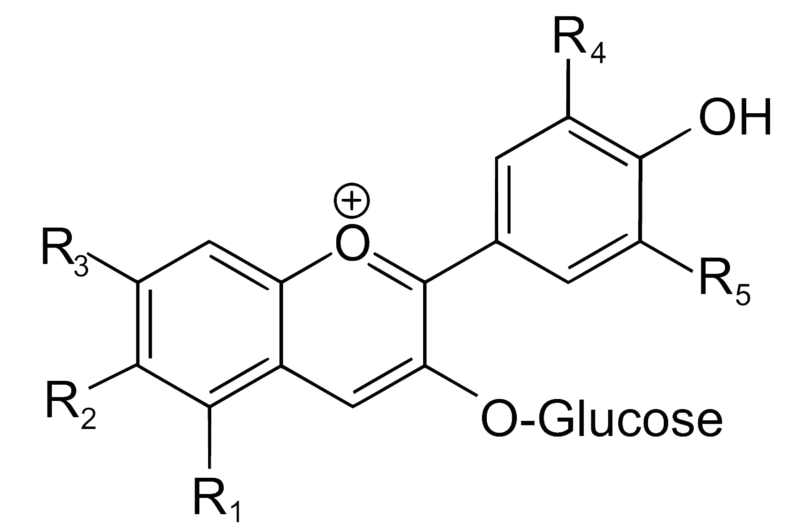 The main colorant of indigo is indigotin, systematically named 2,2’-bis(2,3- dihydro-3-oxoindolylidene). Adolf von Baeyer reported its structure in 1883, initially suggesting it adopted the cis-configuration. The trans-form is stabilised by intermolecular hydrogen bonding, preventing rotation around the central double bond, while the cis-form is destabilised by repulsion between the two carbonyl groups. The cis form has been isolated but rapidly reverts to the more stable trans-form during storage. Indigofera plants are composed of a vast number of complex organic substances including alkaloids, flavonoids, phenols, tannins, saponins, glycosides and terpenoids (Felicia, 2012; Oko, 2014). Many have interesting pharmacological properties. One of the glycosides is indican, a glucoside, the sole precursor of indigo dye in Indigofera and Polygonum (Gilbert and Cooke, 2001). In Polygonum it has been found that the indican is overwhelmingly concentrated in the leaves (Minami et al., 2000). Woad, Isatis tinctoria, contains two precursors of indigo, 80% in the form of isatan B and 20% in the form of indican (Epstien et al 1967). Indigofera also contains glucosides of kaemferol, a pre-cursor of the yellow colorant kaemferol, a flavonoid that is widely distributed in the plant kingdom. Indican was first isolated from Polygonum tinctorium by Schunk in 1855, with Marchlewski and Radcliffe revealing its structure in 1898. The quantity of indican present in fresh Indigofera has been reported to be in the range 1.5 to 2%, depending on the species. However a recent EU analysis of Indigofera tinctoria measured an indican content of 3.5% (Opinion on Indigofera tinctoria 2012). Indican is colourless and soluble in water. It is a glucoside of indoxyl, the key ingredient of leuco-indigo. With Japanese indigo, Polygonum tinctorium, the indican is hydrolysed into indoxyl by the enzyme β-glucosidase (Minami et al 1997). In woad, isatan B is hydrolysed to indoxyl (Kokubun et al 1998). Some but not all of the indoxyl combines with itself to produce the dianion salt, leuco-indigo or indigo-white, which is soluble and actually coloured light yellow. In the dyeing process the yarns are immersed in the leuco-indigo and are then exposed to the air. In the presence of oxygen the leuco-indigo is oxidised into the blue indigotin, which is insoluble in water and therefore precipitates on the surface of the fibres. The same reaction occurs if the dye bath is vigorously aerated, the indigotin forming a thick sludge at the bottom of the dye bath. Indigo yield depends on the alkalinity of the dye bath. Excess alkalinity reduces indigo yield, while modest alkalinity optimises the conversion of indoxyl to indigotin. 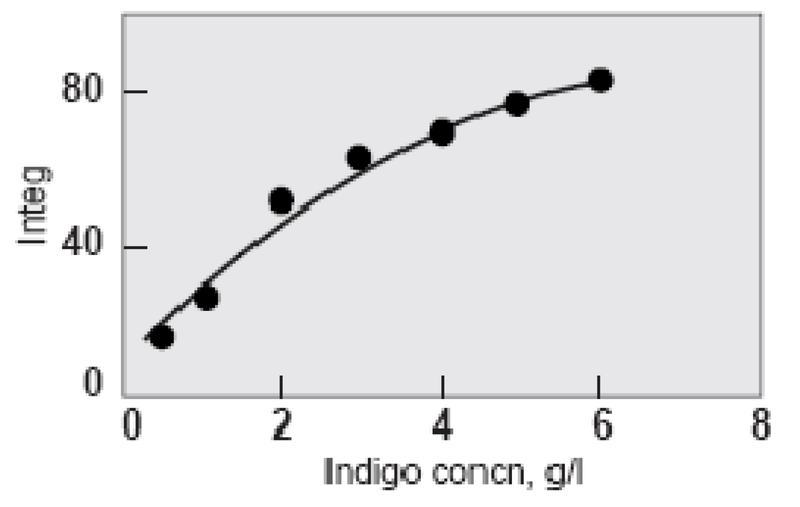 Even so the conversion of leuco-indigo to indigotin is only ever partial – commercial dyers only achieve an extraction rate of 60 to 70% (Perkin and Everest, 1918) and even under laboratory conditions indigo yield does not exceed 85% (Russell and Kaupp, 1969). This is due to several reasons – not all of the indican is extracted from the leaves, not all of the indigotin is precipitated (because indigotin and leuco-indigo exist together in equilibrium), and some of the indoxyl is consumed by side reactions. 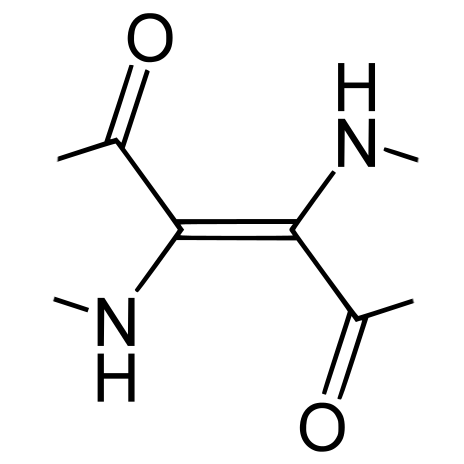 The main side reaction during oxygenation begins with some of the indoxyl converted into isatin and anthranilic acid (Cotson and Holt, 1958). The isatin then readily combines with the remaining indoxyl to produce indirubin which, being only slightly soluble in water, also precipitates with the indigotin. Indirubin is also known as red indigo, but it is actually red-violet. However it is not particularly colourfast. 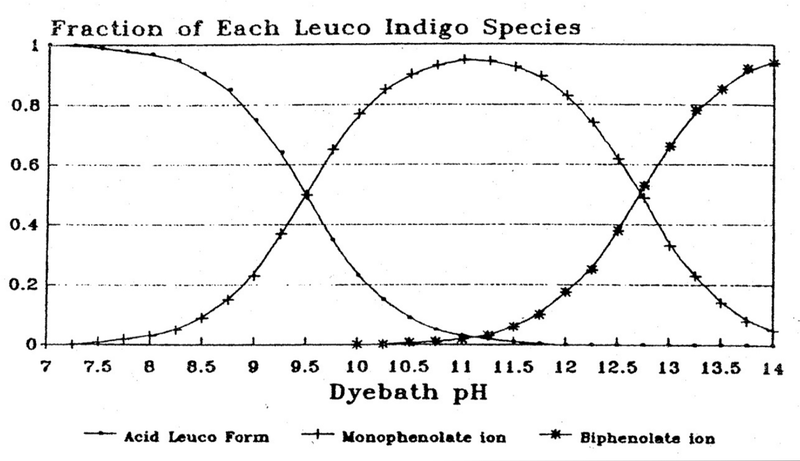 If pre-prepared indigo paste is added to the dye bath the indigotin must first be reduced by alkaline fermentation (or a reducing agent such as sodium dithionite) into the soluble leuco-indigo. Fermentation relies on the presence of reducing alkaliphilic bacteria that have grown from the cocktail of vegetable matter and nutrients, assisted by the presence of glucose. Various bacteria strains have been identified, such as Clostridium, Pseudomonas, Cyanobacterium, Micrococcus or Bacillus (Wassenaar, 2012). Clostridium isatidis seems to be the bacteria responsible for the fermentation of woad (Padden et al 1998 and 1999). It is clear that natural indigo dye not only contains indigotin, but also indirubin, kaemferol and other flavonoids, and possibly minor amounts of cis-indigo and brown isoindigo. The variable admixture of these colorants, especially indirubin, leads to variations in the colour of indigo extracted from Indigofera plants and means that the natural dyeing process is never reproducible from one dye bath to another. In the solid state indigo crystallises into a lattice, held together by two types of non-covalent bonding: π-π interactions and hydrogen bonds. π-π interactions are not yet fully understood, but arise from the attractive force between the rings of adjacent aromatic organic molecules. Hydrogen bonding occurs when a hydrogen atom is located between two electronegative atoms, normally oxygen and nitrogen. Within the lattice each indigo molecule is hydrogen-bonded to four neighbours, forming a pentamer. The indigo molecules are then arranged in stacks with their aromatic rings lying parallel to each other, said to be π-stacked. However neighbouring piles are tilted relative to each other. The combination of these two forms of bonding gives rise to high lattice energies and consequently high thermal stability and low solubility. The colours of indigo and Tyrian purple are both blue in an organic solvent, but are respectively blue and purple when used as dyes. To explain this dichotomy it has been proposed that while monomers may attach to the fibres at low dye concentrations, dimers and trimers are formed at higher concentrations (Clark and Cooksey 1999). The purple colour of Tyrian purple dye arises because of the closer stacking in the dimers and trimers brought about by the attraction between the bromine atoms. To study why the colour of bromoindigo changes with temperature (thermochromicity) carbon nanotubes were used as surrogate fibres and the size of the dye aggregates were measured using a transmission electron microscope. It was found that smaller aggregates reflect blue light, and larger aggregates reflect red. Monobromoindigo dye contained mainly small aggregates along with some larger aggregates that created a violet colour. Heating broke down the larger aggregates into small aggregates, creating a bluer colour. 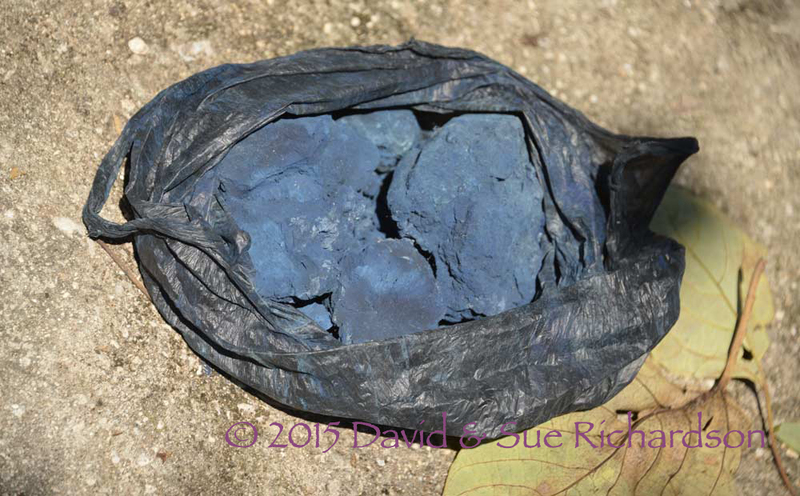 Conversely dibromoindigo dye has mainly larger aggregates alongside a few smaller ones to give a purple tone. Heating converted the smaller aggregates into larger ones, creating a redder colour (Mironova 2013, Lavinda et al 2013). The implication is that the colour of indigo dyes depends just as much upon how they form molecular aggregates as it does upon their basic molecular structure. 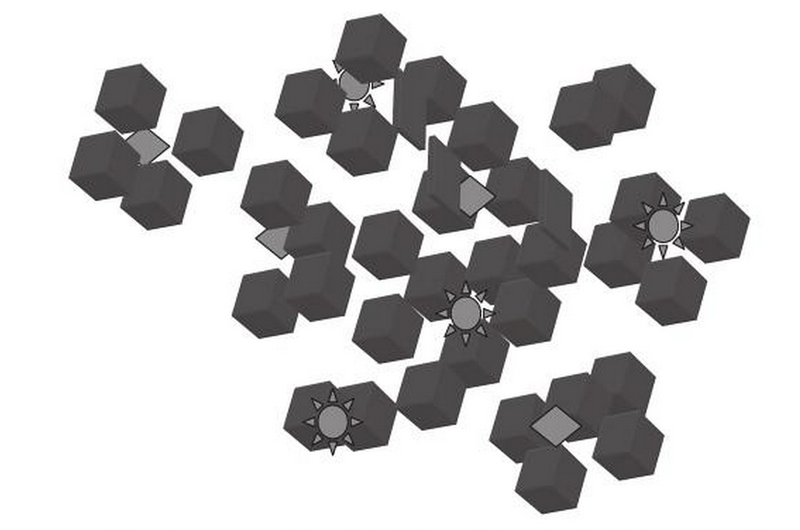 A different study distinguished between molecular clusters and much larger molecular aggregates. 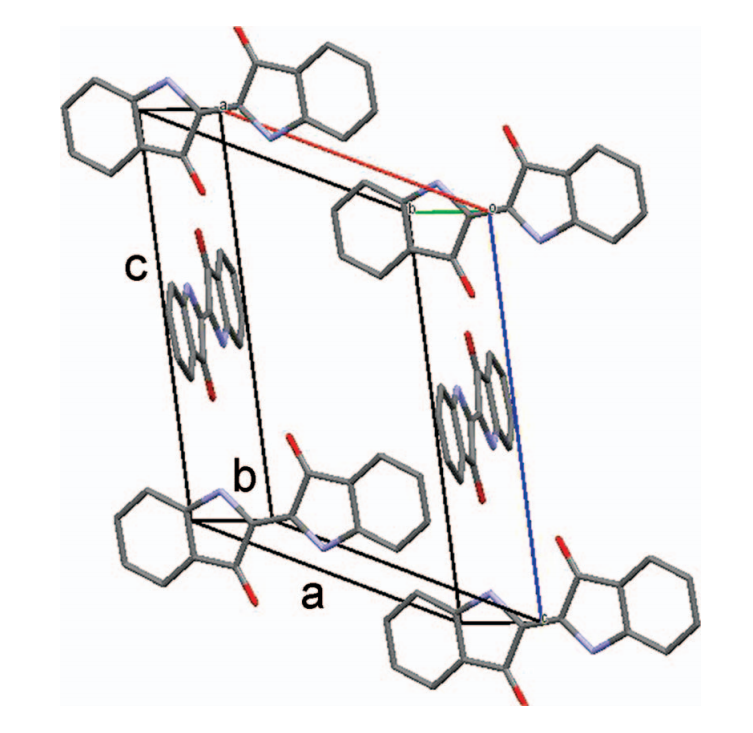 It found that a cluster of 1-3 molecules of 6-bromoindigo was red, a cluster of 4 molecules was purple and a cluster of more than 6 molecules was dark blue (Ajiki, 2014). Thus bromoindigo is a red gas, but is purple in solution and blue as a solid. Randomly arranged small clusters form large aggregates that are red, while efficiently packed large clusters form small aggregates that are blue. In the real world it seems that impurities within the indigo dye bath may play a key role in the formation of dye aggregates. There are indications that indoxyl is adsorbed onto the solid particles within the dye bath, such as ionised minerals and colloidal organics. After alkalisation and oxygenation the indoxyl is converted into indigotin, which coats the particulate impurities forming micro-aggregates (García-Macías and John, 2004). This explains why it is difficult to remove impurities once the indigo has been dyed - the impurities are protected from being removed by washing. As the uneven surfaces of these micro-aggregates become extremely small, optical interference can create an iridescent effect. An attempt to compare the aggregation of natural Japanese Awa indigo produced from Polygonum, with synthetic indigo by means of ultrafiltration concluded that the molecular weight of the former exceeded 30,000, while that of the latter was less than 5,000 (Kawahito 2009). Given that the molecular weight of indigotin is 262, this implies that micro-aggregates of Awa contained in excess of 115 molecules while those of synthetic indigo contained less than 19. When cotton fibres are dyed with indigo, only the outermost fibrils of the fibre take up the dye and the core remains white. 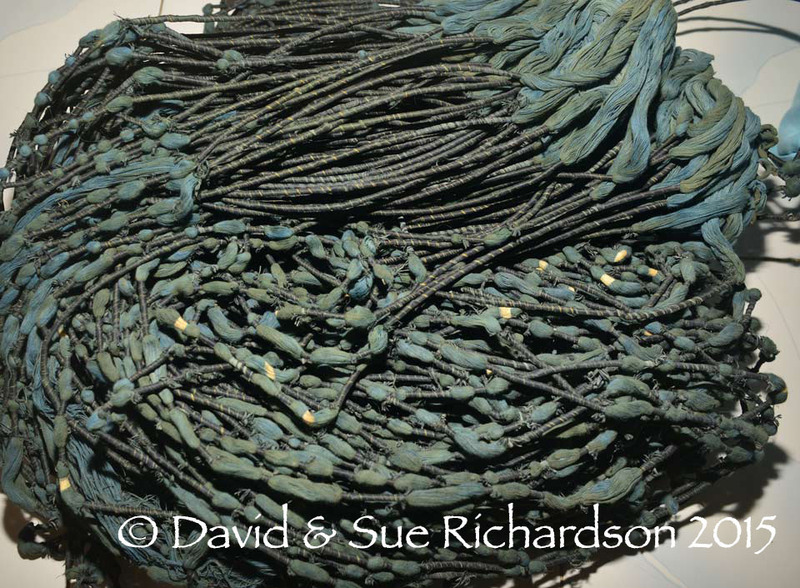 The dyed fibrils act as a barrier, preventing the indigo penetrating further into the undyed part of the fibre. The phenomenon is called ring dyeing and is considered one of the desirable features of indigo dyeing since it not only produces uneven shading in the finished dyed cloth, but also creates low abrasion resistance - abrasion quickly removes the dye from the outer layers of the fibres creating the washed out effect so highly valued with blue denim. Let us first consider dye substantivity - the affinity of a dye for its substrate, for example cotton or silk. Although indigo has a low substantivity for cotton, that substantivity is highly dependant on the pH of the dye bath – significantly increasing as the pH is reduced from highly alkaline 13.5 to moderately alkaline 10.5 (Etters 1996). This trend is limited by the fact that the pH must always remain higher than 9.9 for the indigo to be maintained in the soluble leuco-indigo form (Leupin and Hartmark 1943). The chemistry underlying this effect is as follows. High pH not only ionises the indigo, replacing the monophenolic form of ionic leuco-indigo with the less substantive diphenolic ionic form, but also the cellulose. As the cellulose becomes more ionic (negatively charged) it increasingly repels the ionic (also negatively charged) leuco-indigo, the di-ionic form being repelled more than the mono-ionic form. The optimum pH is around 11 when the fraction of the monophenolic form is at its maximum. Furthermore as the pH of the dye bath is reduced from 13.5 to 11, cotton yarn becomes progressively more and more ring dyed (Etters 1995). At the same time the colour yield or shade depth increases because there is less cotton to take up the same amount of dye. At a given pH, dye take-up increases with the increasing concentration of indigo in the dye bath. However, the relationship becomes self-limiting - as the concentration increases it becomes harder and harder to raise the colour yield (Holbert 2011, 64). Shade depth at increasing indigo concentration (Holbert 2011). Integ measures dye reflectance across the entire range of visible wavelengths. This means that increased colour depth cannot be achieved solely by increasing dye concentration. The solution is to increase the number of dips. Even so, the law of diminishing returns still applies. After the eighth dip the change in depth of shade significantly decreases although still continues to darken (Chong et al 1995, Xin 2000). There is also a shift in colour-cast from a greenish dark blue to a redder less blue as the number of dips increases. 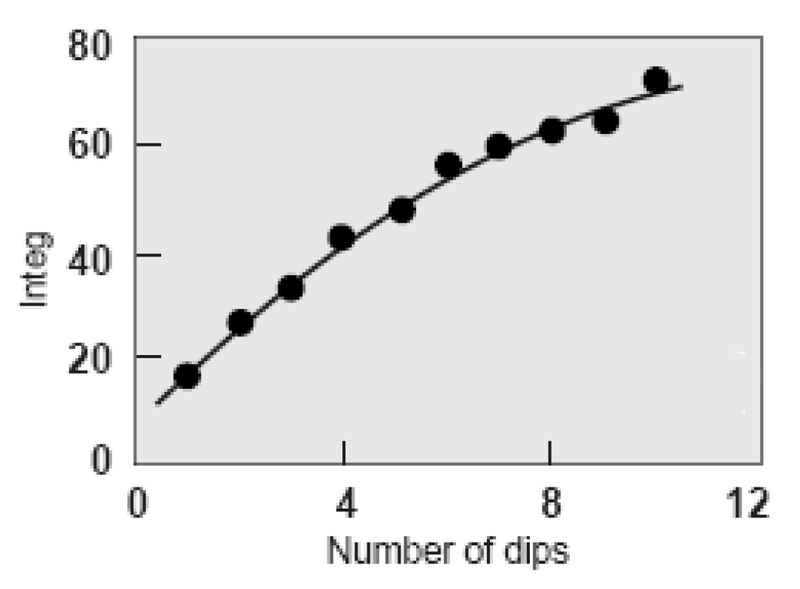 The optimum number of dips was judged to be ten. Visible light covers a narrow spectrum of electromagnetic wavelengths from 380 to 720 nanometres (nm), ranging from violet (380-400nm) to red (635-720nm). When a material is illuminated with white light some wavelengths are reflected, some are absorbed, and the remainder are transmitted. This completely depends upon the chemical composition and physical state of the material concerned. We perceive its colour by the wavelengths that are reflected, not by those that are absorbed or transmitted. Indigotin absorbs light in the green, yellow, orange and red parts of the spectrum but reflects light in the indigo, blue, light blue, and especially in the magenta and infrared parts of the spectrum. 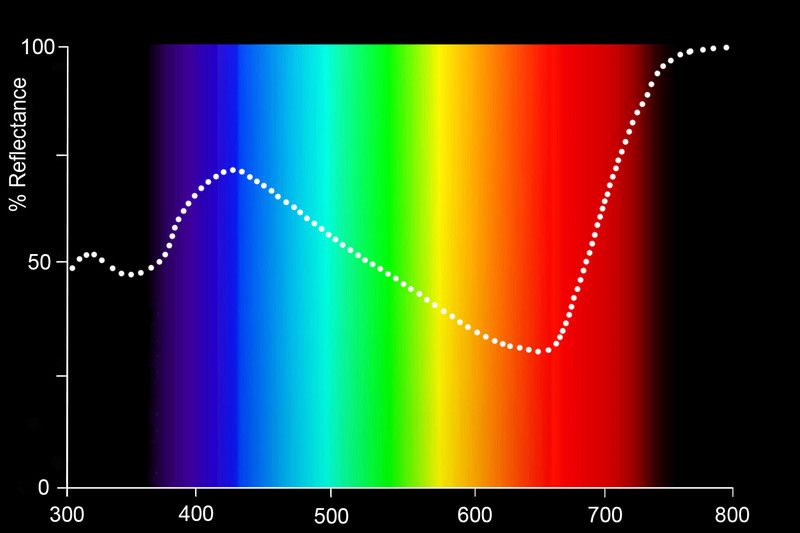 Most organic compounds absorb light in the UV, not the visible part of the spectrum. It is unusual for such a small molecule with such a limited conjugated structure to have such red-shifted absorption and to therefore appear blue. 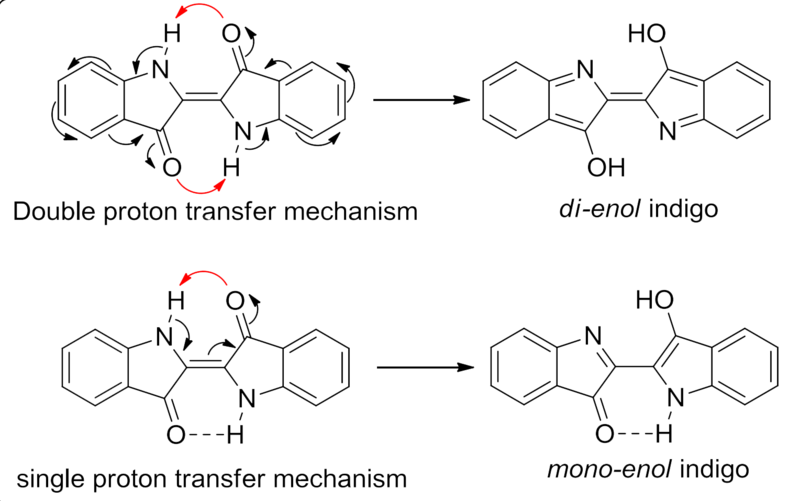 Normally more extensive conjugation is required to produce blue dyes – conjugation being a quantum effect that occurs when a molecule has alternating single and double bonds, allowing the bonding electrons to become delocalised and exist in a more stable, lower energy ground state with a smaller energy difference to its excited state. As conjugation increases, so a molecule tends to absorb light at longer wavelengths. The excitation energy is inversely related to the wavelength of maximum absorbance by the equation ΔE = hc/λmax, where h is Plank’s constant and c is the speed of light. A λmax of 650nm is equivalent to an energy transition of about 1.9eV. 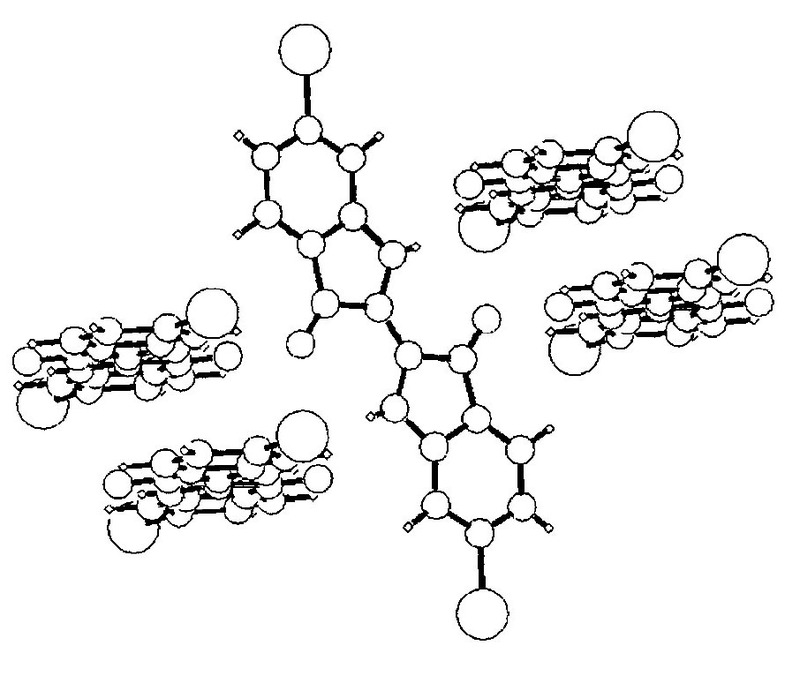 In the 1960s Lüttke et al (1966) chemically stripped down the indigotin molecule, selectively removing the phenyl rings and other components while observing the changes in optical behaviour. They concluded that the colour of indigo is determined by the cross-conjugated structure at the centre of the indigotin molecule, which they termed the H-chromophore, along with its highly polarized charge distribution, which strongly influences its ability to form hydrogen bonds. The chromophore has two electron donor groups (NH) and two electron acceptor groups (C=O carbonyl), cross-conjugated through a central ethene bridge. One theory is that light photo-excites the H-chromophore part of the indigotin molecule, causing a jump from the keto form to the excited enol form as a result of ultrafast proton transfer from the nitrogen atoms to the oxygen atoms. The excited state almost instantly reverts back to the normal state, dissipating the energy of photo-excitation. Because the excited enol form is still relatively stable, the energy of photo-excitation is relatively low (around 2eV), meaning that the indigoid dyes absorb light in the visible spectrum. Some studies have suggested that only single proton transfer occurs, with only half of the molecule being excited to the enol state. However the colour of indigo is not solely dictated by the energy difference between its stable and photo-excited state. As we have already seen, an additional factor is that indigotin molecules cluster into micro-aggregates as a result of hydrogen bonding (Clark and Cooksey 1999). This not only modifies the reflected colour, but also creates an uneven surface, causing interference and an iridescence effect. For indigotin, the wavelength of maximum absorbance, λmax, depends on its physical state. In the gas phase, which purely consists of single molecules, indigo is red with a λmax of 540nm. In a nonpolar solvent such as carbon tetrachloride it is 595nm; in a polar solvent such as ethanol or dimethyl sulphoxide it ranges from 605 to 620nm; for amorphous indigo it is 650nm; and for crystallised indigo it is 675nm. This bathochromic shift of colour in the liquid and solid phase is due to intermolecular hydrogen bonding. In nonpolar solvents it is likely that intra-molecular hydrogen bonds are favoured, encouraging the formation of molecular aggregates. In polar solvents there is probably additional hydrogen bonding with the solvent molecules. In the solid state X-ray structure analysis shows that each indigo molecule is attached to four others, whereas in crystalline indigo the indigo pentamers are also π-stacked. Infrared radiation is far less energetic than visible light - too low to excite the electrons in a molecule, but sufficient to excite the vibrational state of a chemical bond. IR spectra normally show the percentage of IR transmittance against wavelength measured in terms of wavenumber – the number of waves in one centimetre of length. The following spectrum covers the range 4,000 to 400 waves per cm, equivalent to wavelengths from 2,500nm to 25,000nm. Indigotin is a poor absorber of near-infra-red radiation, but does absorb infrared at specific longer wavelengths. 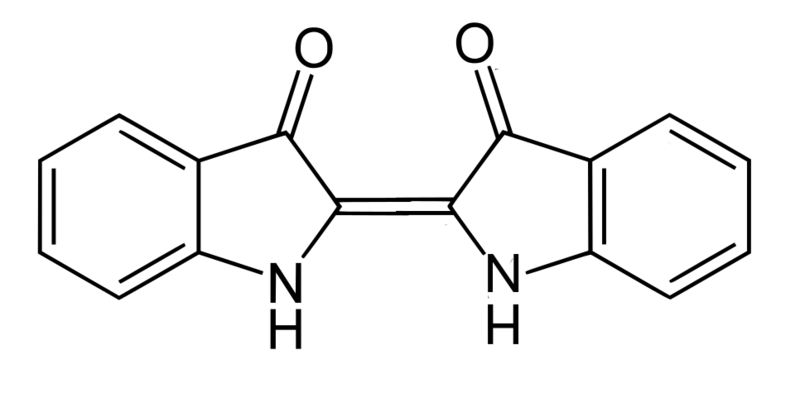 The absorption at 3300cm-1 corresponds to the excitation of the NH bonds, while the strong characteristic absorption at 1626cm-1 corresponds with the CO bonds. Indigo is one of the most light-stable natural organic textile dyes. Even so it has only moderately good fastness to light and fades much faster on cotton than on wool (Padfield and Landi 1966). Measured in terms of the 1990 British Standard 1009 for light-fastness (1 = very poor light fastness; 8 = very high), fading is rated at level 4 on cotton and level 4-5 on wool. On this grading scale, each level takes roughly twice as long to fade as the preceding level. In one of the earliest tests, indigo was placed behind glass and exposed to Parisian sunlight. It faded within 15 days on cotton but much more slowly on silk and wool. Even so, fading on silk and wool was noticeable after 75 days (Chevreul 1837). A later study found that all natural dyes have poor light fastness, but dyes such as indigo, morinda, madder, lac, cochineal and kermes, were better than most. The workers concluded that for museum displays in low light, only indigo on wool, madder on cotton and a couple of other dyes would survive long exposure. Even in the dimmest tolerable conditions, fifty years of permanent exhibition would fade indigo on cotton (Padfield and Landi 1966). One study measured the colour change in Asian and Indian textiles exhibited at the Australian National Gallery in Canberra for a period of three months in 1990, during which they were illuminated by tungsten-halogen spotlights (Ford 1992). Some of the highest levels of fading were measured on two indigo-dyed cotton textiles from Sumatra and a third from the Coromandel coast of India. Only turmeric and ferric mud were more sensitive. On the other hand an indigo-dyed cotton skirt from the Ngada region of Flores and an indigo-dyed batik from Java showed two of the lowest levels of fading. This suggests that other unidentified factors may be involved in the photo-oxidation of indigo. Indigo is clearly more stable on animal fibres. A later study using a powerful fading lamp graded indigo on wool at level 5-6 (Duff, Sinclair and Stirling 1977). After 240 hours of exposure, indigo became slightly greener, weaker and duller. One advantage of indigo is that as it fades there is only a moderate change in hue. This is because it is photo-oxidised into yellow-coloured isatin, which is relatively colourless compared to indigo blue. In solution, natural indigo fades more rapidly than synthetic indigo. It has been suggested that this is because in solution, impurities reduce the size of indigo micro-aggregates (Novotná et al 2003). When used as a pigment in paint, the colour-fastness of indigo varies considerably and when applied using an oil or egg yolk medium it can fade rapidly due to chemical breakdown of the indigotin (van Eikema Hommes 2002). The colour of dyed indigo depends significantly on the fibres used in the textile substrate. Cotton is one of the hardest fibres to dye, but animal fibres such as wool and silk, as well as certain synthetic fibres such as nylon and acetates, take up the dye more effectively. One explanation is that leuco-indigo is strongly attracted to a fabric’s polar functional groups by a combination of hydrogen-bonding, ionic, polar and nonpolar interactions (Cooksey and Sinclair 2005). As the dye is applied to the fabric, the molecules interact with the fabric and with each other. When the indigo is oxidized back into its insoluble form, the attraction between the dye molecules prevails over the attraction between the dye molecules and the substrate, creating dye aggregates. Textiles which appear bluer have a stronger dye molecule-fabric interaction, while materials with violet hues have more dye aggregates. 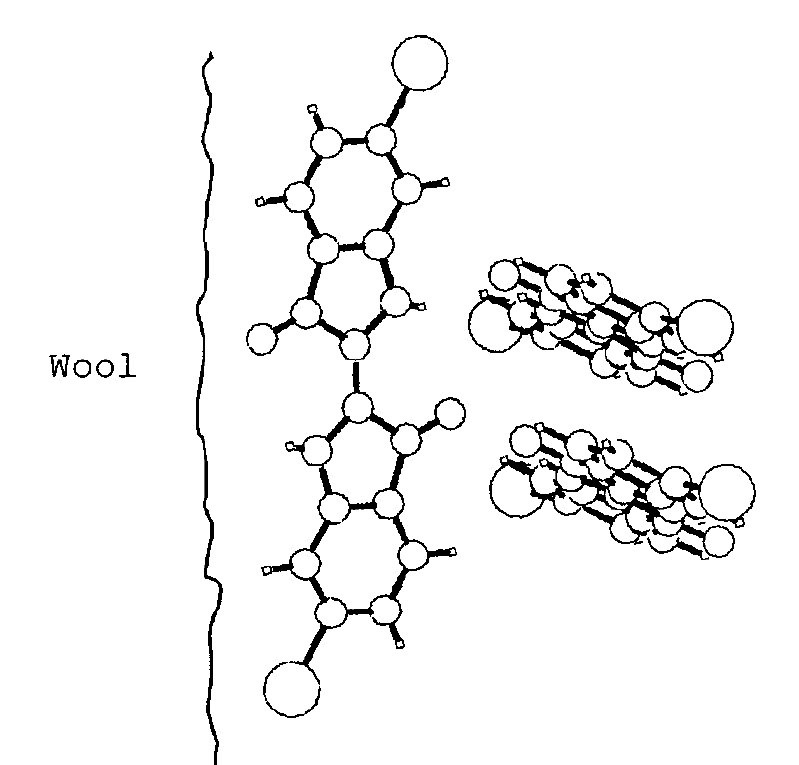 Nylon has a stronger attraction to dye molecules than wool, thus nylon appears bluer. On the other hand, fabrics with exceptionally distinct chemical structures - such as cotton and polypropylene - dye with almost identical indigo shades. She concluded that that differences in the shade of indigo dyed on different fibres depended primarily on the arrangements of the dye molecules with respect to each other, rather than on the functional groups of the fibre material. This was reinforced by the fact that after brief boiling in water, fabrics changed color irrespective of their structural composition. Mironova proposed that the differences in the colour of indigo on different fibre types were the result of the specific sizes of indigo micro-aggregates formed on the fibre. However no mechanism was suggested as to how the composition of different fibres should influence micro-aggregate size. At room temperature, indigotin crystallises into blue-violet needles or prisms with a coppery lustre. Intra- and inter-molecular hydrogen bonding are the reasons why indigotin is so stable to temperature and has such a relatively high boiling point, reported as 390 to 392°C. Above 170°C it sublimes into a fiery red vapour with a violet tinge. It is not thermochromic, in other words it does not change colour when heated, unlike bromo-indigo and di-bromo-indigo, which share a very similar chemical structure. Indigotin is insoluble in water, dilute alkalis and dilute acids. This gives it good wash-fastness. It is slightly soluble in polar, high boiling-point solvents such as aniline and dimethyl sulphoxide. Indigotin is tasteless, has no smell and has low toxicity. It is degraded by dilute nitric acid into indigotic and picric acid, and violently degraded by concentrated nitric acid into carbazotic acid. It reacts with sulphuric acid to form indigo sulphate. Oxidising agents such as chlorine and hydrogen peroxide convert it into isatin. Consequently the dye has limited chlorine fastness. Its most important property is that it is easily reduced by agents such as sodium hyposulphite into soluble leuco-indigo. Adolf von Baeyer synthesised indigo from isatin in 1870, and from phenylacetic acid in 1878. He reported its chemical structure in 1883. After developing a better industrial synthesis from cinnamic acid, obtained from coal tar and nitric acid, von Baeyer sold his patent to BASF who began producing synthetic indigo commercially in 1897. However the process was not economic and could not compete with the natural product. BASF and Höechst joined forces to find a better route, starting from readily available aniline, and by 1902 both companies opened plants for the multi-tonne production of the dye. By 1903 the world price of indigo had halved, initiating a progressive collapse in the Indian natural indigo industry over the following two decades. Dow started production in the USA in 1911. Because its properties were technically inferior to high performance blue vat dyes such as indanthrone, its use declined during the first half of the twentieth century, only coming back into fashion during the 1960s. It has been claimed that natural dyes are aesthetically superior to synthetic dyes because they reflect light in all major parts of the visible spectrum (blue, green/yellow, and red) whereas synthetic dyes are monochromatic – they reflect light in just one part of the spectrum (Böhmer 2002; Eiland 2003, 51). Consequently natural dyes do not look as harsh as synthetic dyes and sit together more harmoniously because they each contain elements of their neighbouring colours. Unfortunately it is hard to find evidence to support this claim – many synthetic dyes have reflectance spectra that cover a wide range of wavelengths, just like natural dyes. When it comes to indigo, the indigotin in dyes produced from fermented plant material is of course chemically identical to synthetic indigotin. However naturally derived indigo is by no means as pure and contains many impurities – up to 40% by weight. Some of these are additional dye colorants, the two most important being indirubin or indigo red (from 2 to 10%) and kaemferol or indigo yellow. Other contaminants include various flavonoids and possibly cis-indigo and brown isoindigo. Because the composition of this cocktail varies from dye batch to dye batch, the colour of naturally derived indigo dye is never reproducible. In addition, naturally derived indigo contains many particulate impurities ranging from soil, minerals, leaf and stem material and colloidal organics. These act as seeds, attracting indoxyl/indigotin molecules to form micro-aggregates, the size and arrangement of which affects the colour of the dye. Such contaminants are not present in synthetic indigo. 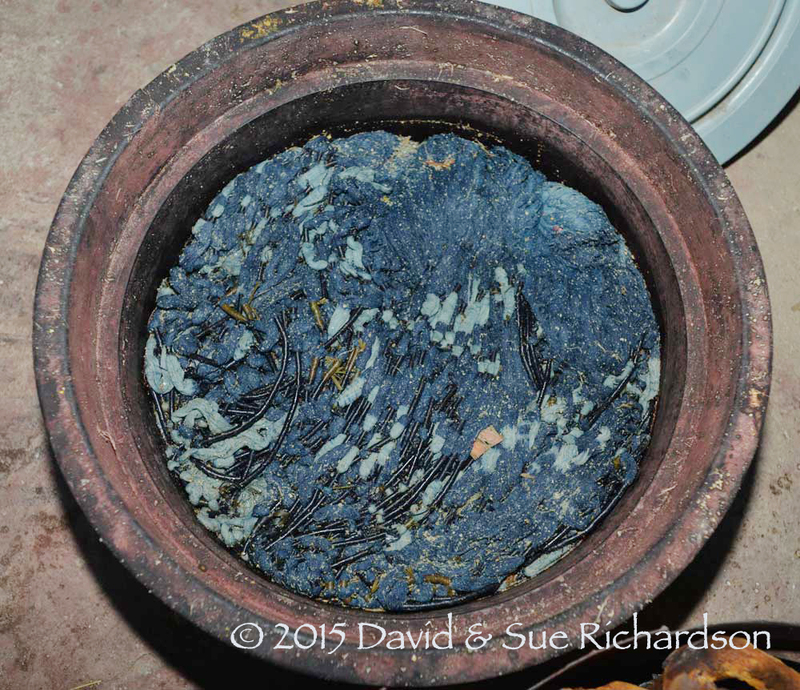 It is hard to find scientific comparisons between naturally fermented and synthetic indigo. 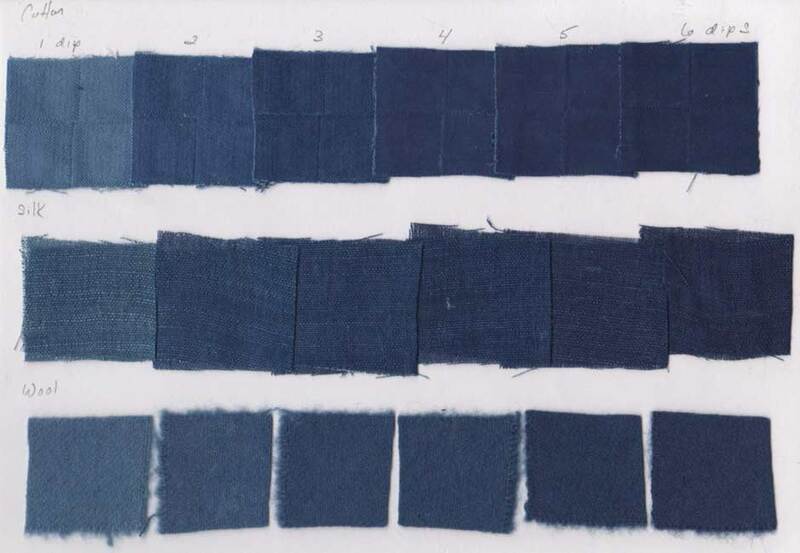 A recent comparison between Japanese ‘Awa’ natural indigo and synthetic indigo found that the former was somewhat brighter and bluer (Kawahito and Yaskawa 2009). 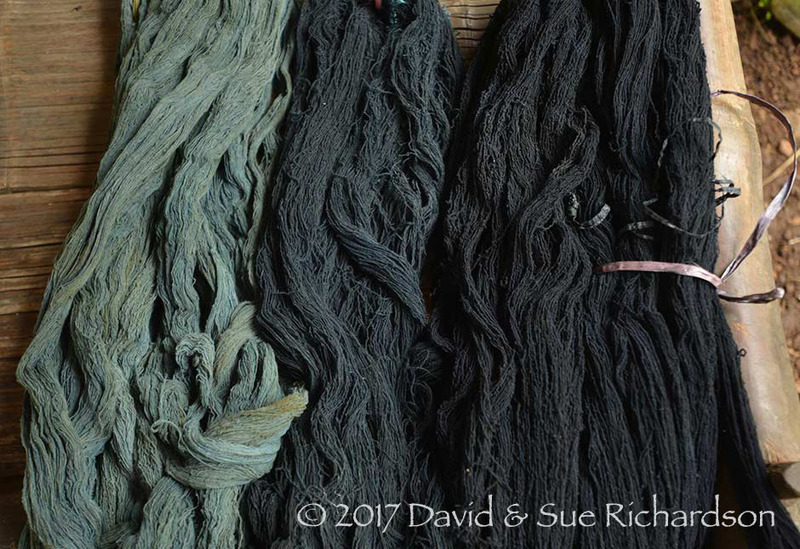 Awa natural indigo had relatively poor fibre penetration but greater dye aggregation, resulting in uneven dyeing. While such a feature might be regarded negatively by commercial dyers it can be seen positively in an aesthetic sense. Adams, Marie Jeanne, 1969. System and Meaning in East Sumba Textile Design: A Study in Traditional Indonesian Art, New Haven, Southeast Asian Cultural report Series 16, Yale University. Balfour-Paul, Jenny, 1998. Indigo, British Museum Press, London. Beckmann, Johann, 1823. A concise history of ancient institutions, inventions and discoveries in science and mechanic art, London. Blust, Robert, 1984-85. The Austronesian Homeland: A Linguistic Perspective, Asian Perspectives, vol. xxvi, issue 1, pp. 52 and 61. Capron, Félicien, 1863. Blues and carmines of indigo: a practical treatise on the fabrication of every commercial product derived from indigo, H. C. Baird, Philadelphia. Chen, Chi-Shi; Brown, Chris W., Bide, Martin J., 1997. Non-destructive near-infra-red analysis for the identification of dyes on textiles, Journal of the Society of Dyers and Colourists, vol. 113, pp. 51-56. Clark R.J.H. and Cooksey C.J., 1999. Monobromo-indigos: a new general synthesis, the characterization of all four isomers and an investigation into the purple colour of 6,6’-dibromoindigo, New Journal of Chemistry, issue 3, pp. 323-328. Cunningham, Anthony B, et al, 2014. Plants as the Pivot: the Ethnobotany of Timorese Textiles, in Textiles of Timor, p. 94, Fowler Museum, LA. Etters, J. Nolan, 1995. Advances in Indigo Dyeing: Implications for the Dyer, Apparel Manufacturer and Environment, Text Chem Color, vol. 27, no.2, pp. 17-22. Etters, J. N., 1996. Recent Progress in indigo dyeing of cotton denim yarn, Indian Journal of Fibre & Textile Research, vol. 21, pp. 30-34. Faridah Hanum, I.; and Van der Maesen, L. J. G., (eds), 1997. PROSEA: Plant Resources of South-East Asia 11: Auxiliary Plants, pp. 156-163, Yayasan Obor, Bogor. Felicia, F. A., and Muthulingham, M., 2012. Phytochemical and HPTLC studies of methanolic extract of Indigofera tinctoria (Fabaceae), Int. J. of Pharm. & Life Sci., 3 (5): 1670-1674. Fokkens, F., 1910. The Great Cultures of the Island of Java, pp. 45-48, Leiden. Fox, James J., 1980. Figure Shark and pattern Crocodile: The Foundations of the Textile traditions of Roti and Ndao, Indonesian Textiles: Irene Emery Roundtable on Museum Textiles 1979 Proceedings, pp. 39- 55, Textile Museum, Washington D.C.
Gaboriaud-Kolar, N.; Nam, S.; and Skaltsounis, A-L, 2014. A Colourful History: The Evolution of Indigoids, in Progress in the Chemistry of Organic Natural Products 99, Springer. Hamilton, Roy W., 1994. ‘Ngada Regency’, in Gift of the Cotton Maiden: textiles of Flores and the Solor Islands, Hamilton, Roy W., (ed. ), p. 104, Los Angeles. Heyne, Karel, 1927. De nuttige planten van Nederlandsch Indie, pp. 271-277, Buitenzorg. Hofmann-de Keijzer, R.; and van Bommel, M. R., 2005. TLC and HPLC Analysis of Red and Violet Cotton Yarns of Indonesian Textiles, Dyes in History and Archaeology, vol. 20, pp. 70-79. Holbert, Richard Moore, 2011. Empirical and Theoretical Indigo Dye Models Derived from Observational Studies of Production Scale Chain Rope Indigo Dye Ranges, Thesis, North Carolina State University. Jansen, P. C. M., and Cardon, D., (eds), 2005. PROTA: Plant Resources of Tropical Africa 3: Dyes and Tannins, pp. 88-99, PROTA Foundation, Wageningen. John, Philip, 2009. Indigo - Extraction, in Handbook of Natural Colorants, Wiley, pp. 105-133. Kawahito, Miyoko; and Yasukawa, Ryoko, 2009. Characteristics of Color Produced by Awa Natural Indigo and Synthetic Indigo, Materials, issue 2, pp. 661-673. Kokubun, T., Edmonds, J., and John, P., 1998. Indoxyl derivatives in woad in relation to medieval indigo production, Phytochemistry, vol. 49, pp. 79-87. Mironova, Irena, 2013. 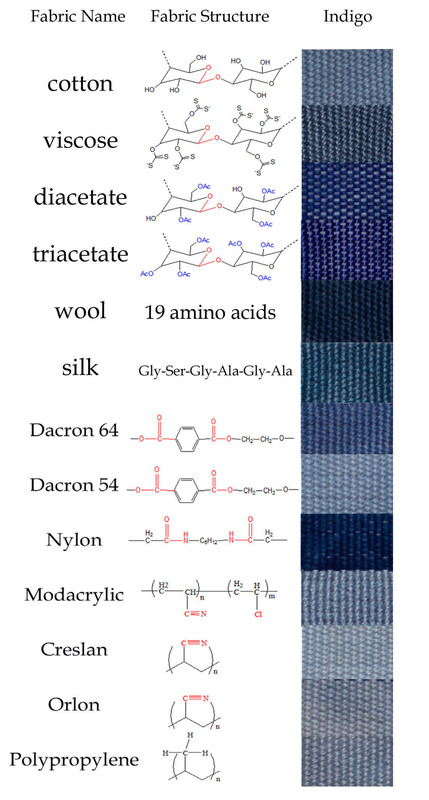 Reflectance Analysis and Thermochromicity of Fabrics Dyed with Indigo, 6-Bromoindigo, and 6,6’- Dibromoindigo, Thesis, City University of New York. Monk, K. A.; De Fretes, Y.; and Reksodiharjo-Lilley, G., 1997. The Ecology of Nusa Tenggara and Maluku, Periplus Editions. Montagner, Crista; Bacci, Mauro; Bracci, Susanna; Freeman, Rachel; and Piccolo, Marcello, 2011. Library of UV–Vis–NIR reflectance spectra of modern organic dyes from historic pattern-card coloured papers, Spectrochemica Acta Part A: Molecular and Biomolecular Spectroscopy, vol. 79, issue 5, pp. 1669-1680. Musschenbroek, S. C. I, W., 1877. Iets over de inlandsche wijze van katoen-verven (rood-verven, bruinverven, blauwverven, enz.) op Midden-Java, en over de daarbij gebruikte grondstoffen. Naar Javaansche bronnen bewerkt, en met aanteekenigen voorzien, Leiden. Oko, A. O., 2014. 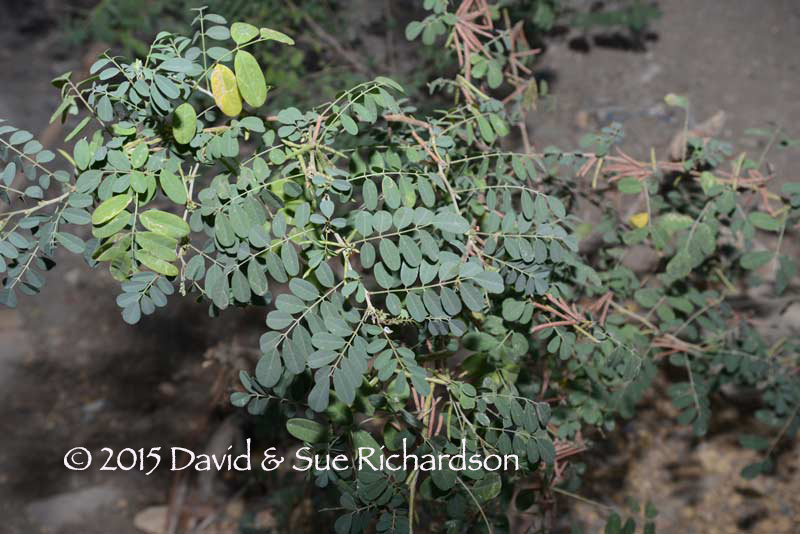 Phytochemical And Antimicrobial Activity Screening of Indigofera Australis, J. Applied Science and Research, vol. 2, issue 1, pp. 190-196. Prideaux, Vivien, 2003. A Handbook of Indigo Dyeing, Search Press, Tunbridge Wells. Sandberg, Gosta,1989. Indigo Textiles: Techniques and History, Lark Books, Asheville, N.C.
Schrire, B. D.; Lavin, M.; Barker, N. P.; and Forest, F., 2009. Phylogeny of the tribe Indigofereae (Leguminosae-Papilionoideae): Geographically structured more in succulent-rich and temperate settings than in grass-rich environments, American Journal of Botany, vol. 96, issue 4, pp. 816-852. Stuart-Fox, D. J., 1993. 'Textiles in ancient Bali', in Weaving Patterns of Life, Nabholz-Kartaschoff, N. L.; Barnes, R.; and Stuart Fox, D. J. (eds), Museum of Ethnography, Basel. Sun, X., and Zheng, X., 1998. Shi Jing, Electronic version, University of Virginia. Teanglum, A., Teanglum, S., and Saithong, A., 2012. Selection of Indigo Plant Varieties and Other Plants that Yield Indigo Dye, Procedia Engineering, vol. 32, pp. 184-190. Vuerema, Anne, 2008. Reduction and Analysis Methods of Indigo, Thesis, University of Turku. Wahid, Abdul, 2013. From Revenue Farming to State Monopoly: The Political Economy of Taxation in Colonial Indonesia, Java c. 1816-1942, Utrecht University.